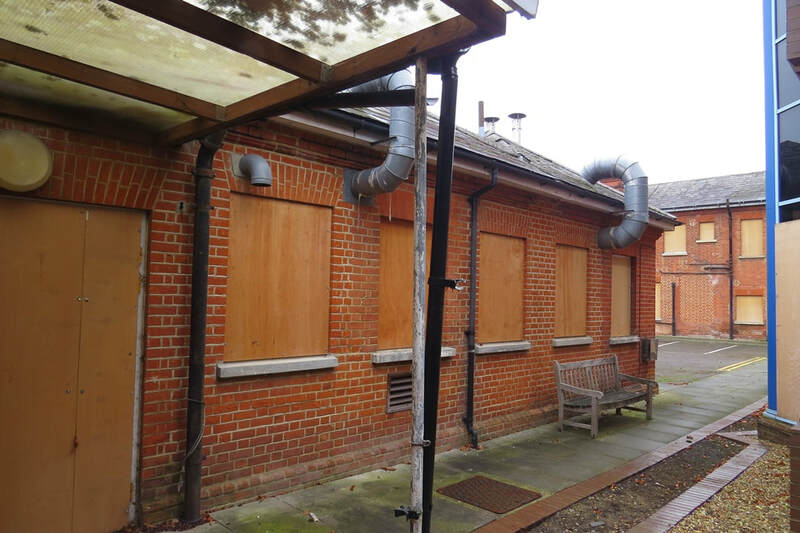 Until the 19th century, standards in private ‘madhouses’ - as they were often called - were very low, and only those able to pay were cared for. 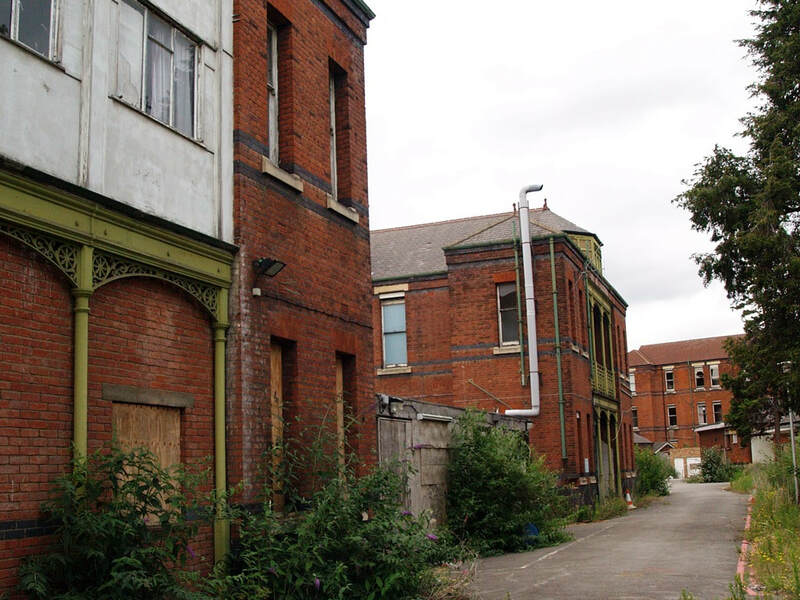 Most paupers were accommodated under dismal conditions, and mentally ill people often wandered the streets or at best were cared for by their families. 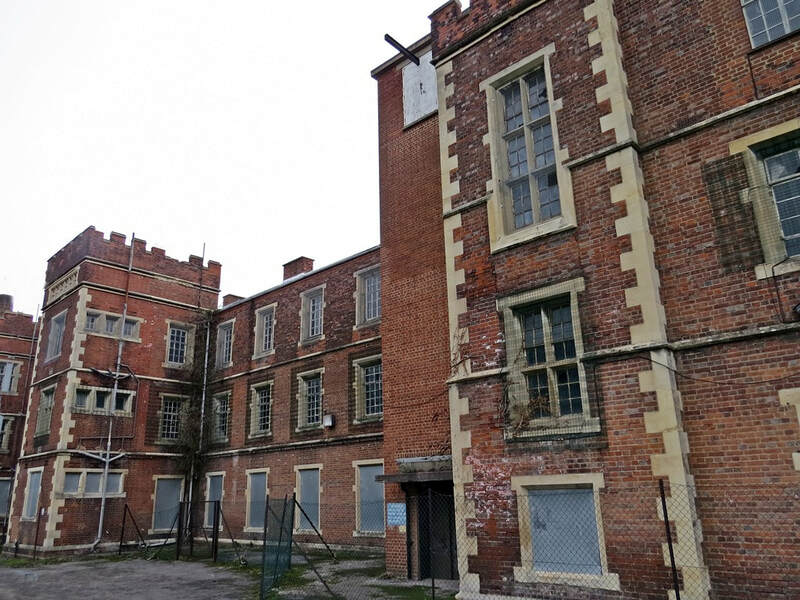 Constructed in Tudor style with subtle angles and variegated brickwork, the asylum was praised in architectural journals at the time, though its gables and twisted chimneys have since been removed as dangerous. 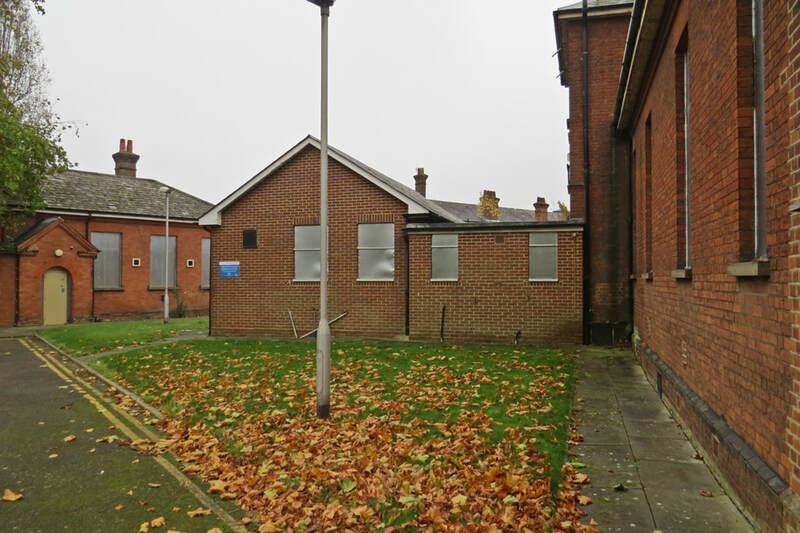 By the 1960s, Springfield had 2,000 beds but with changes in the way in which people’s mental health needs were managed, most of the large old institutions which historically had provided long-term residential care for people with mental health problems had closed. Springfield didn’t close but changed to provide more outpatient facilities and provides only 286 beds on the site. 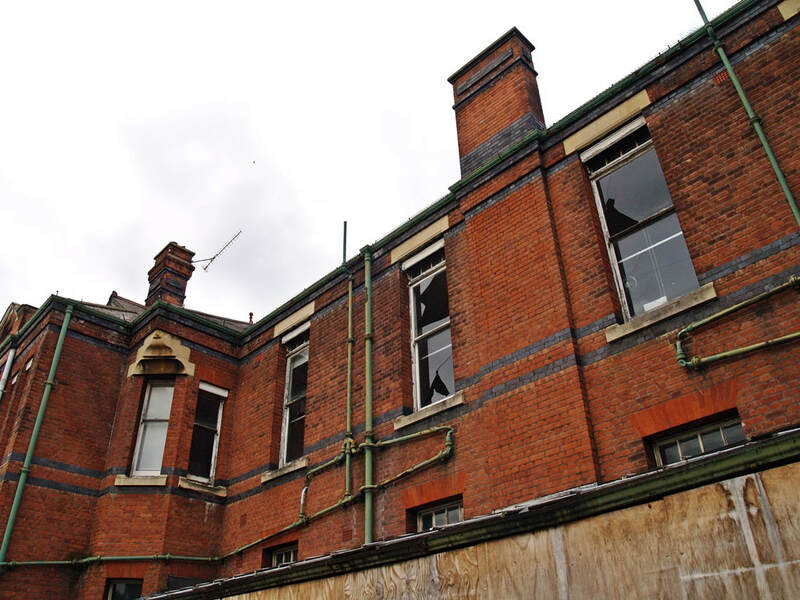 New state of the art buildings have been constructed on the site as some of the old Victorian wards became outdated and have fallen derelict. 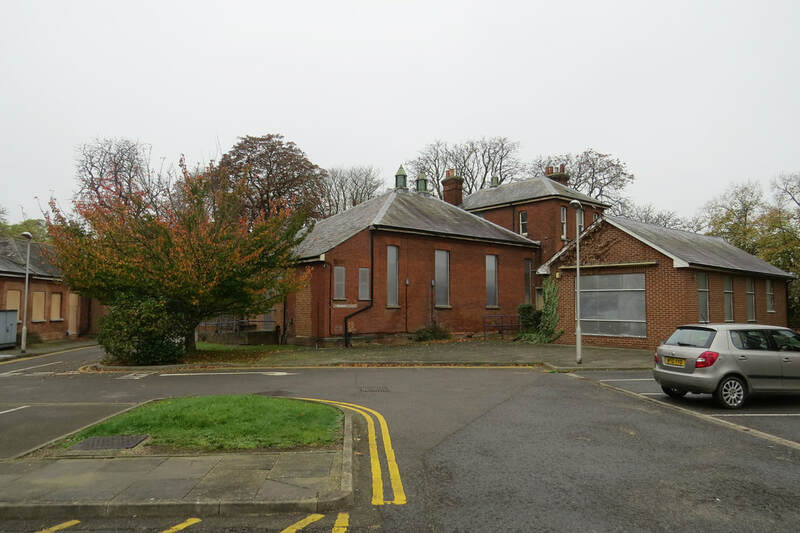 The hospital has sold these buildings to be converted to apartments to raise money for building more medical facilities elsewhere on the site. 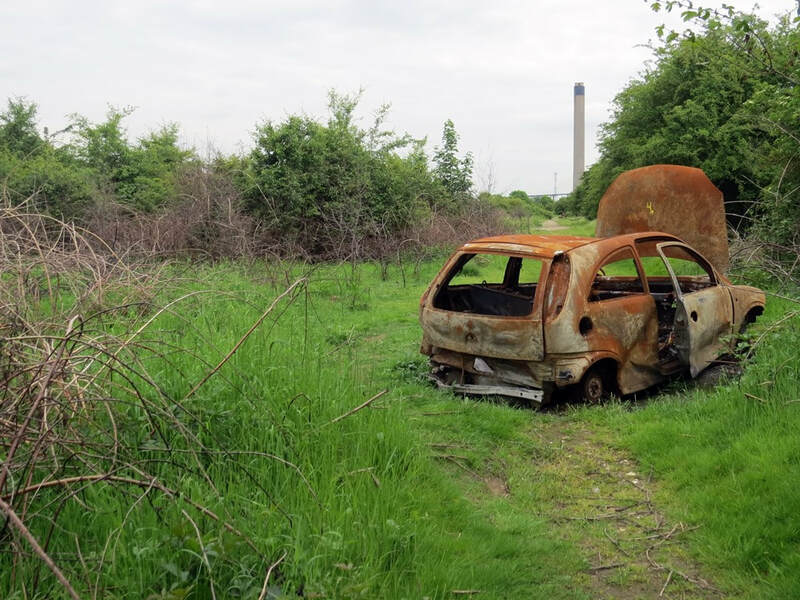 After visiting this site in 2010 I returned in 2019 and was surprised that many of the buildings are still derelict though work is due to commence in Summer 2019. 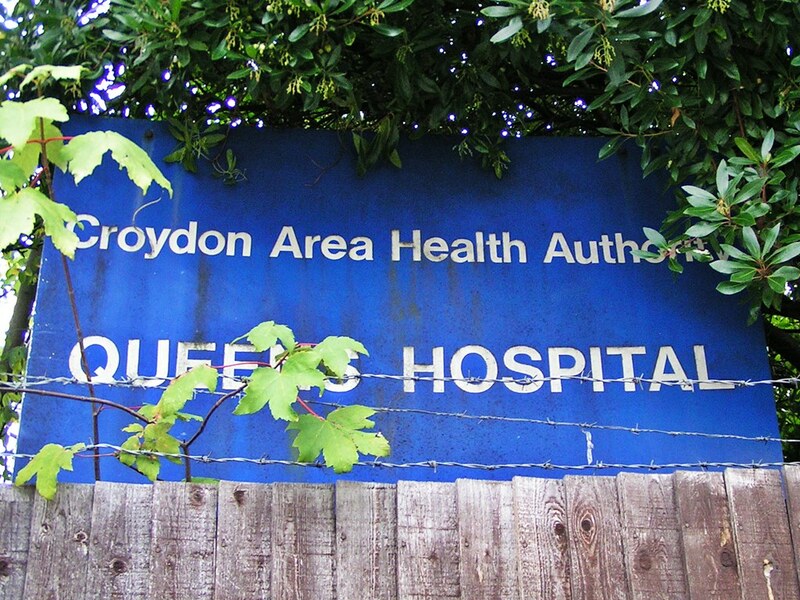 The Trust, which runs the hospital, was criticised in an independent report published in 2000 for "serious management and systems failures, after one patient, Anthony Joseph, was set free and went on to kill Jenny Morrison, his social worker.Ms Morrison was not told by hospital authorities that Joseph, a paranoid schizophrenic who believed he was the son of God, had already threatened staff, had a conviction for carrying a knife and had a history of sleeping with a machete under his pillow. 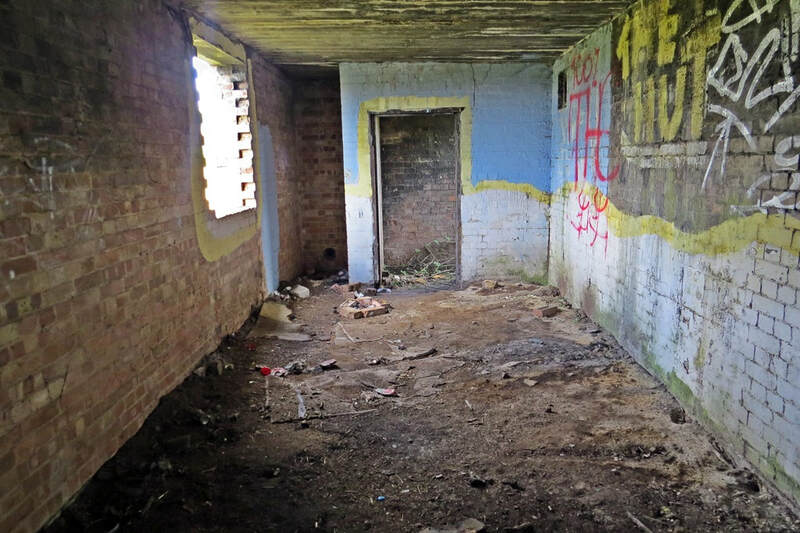 Nor was she informed that Joseph claimed to be plagued by "demons" and that he had said she would be "brave" to see him.As a result, she visited him alone in the hostel where he had been living since his release. Within minutes, he had stabbed her more than 100 times. 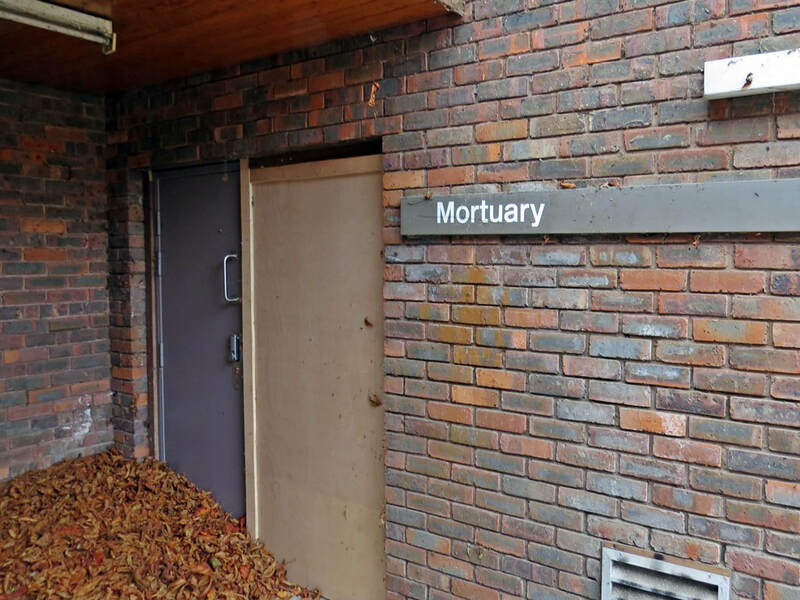 Over the last two decades there have been a number of murders committed by Springfield patients. 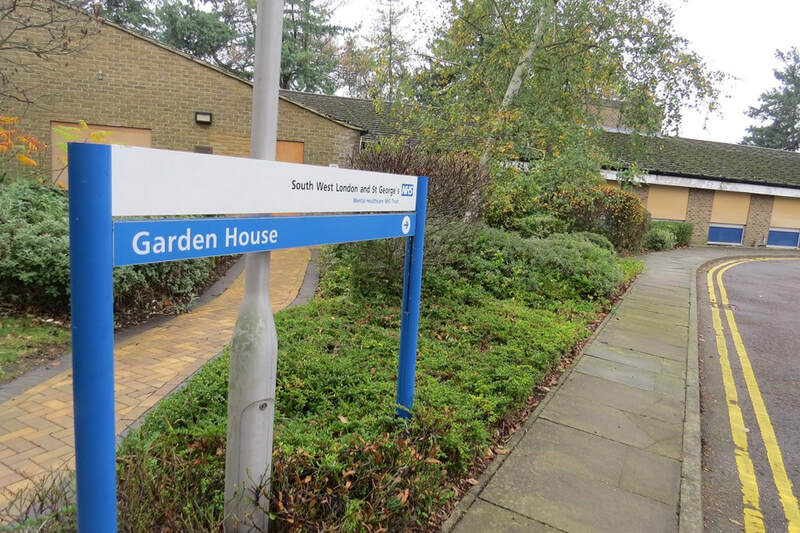 In 2005 the hospital's Trust was fined after after a psychiatric nurse was bludgeoned to death in the hospital lobby by a mentally ill patient. 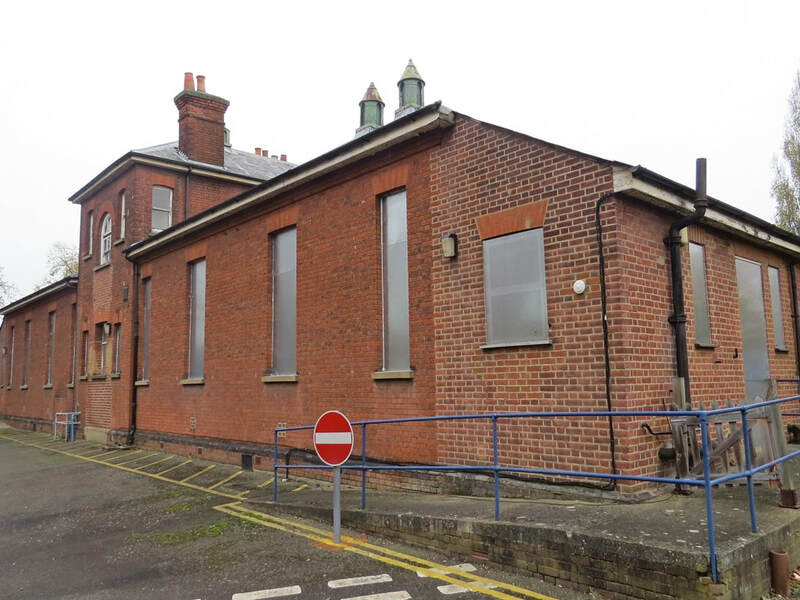 This opened as Barnes Isolation Hospital in 1889 to treat and care for patients with infectious diseases such as diphtheria and scarlet fever.It is now called Barnes Hospital and provides community and inpatient mental health services. 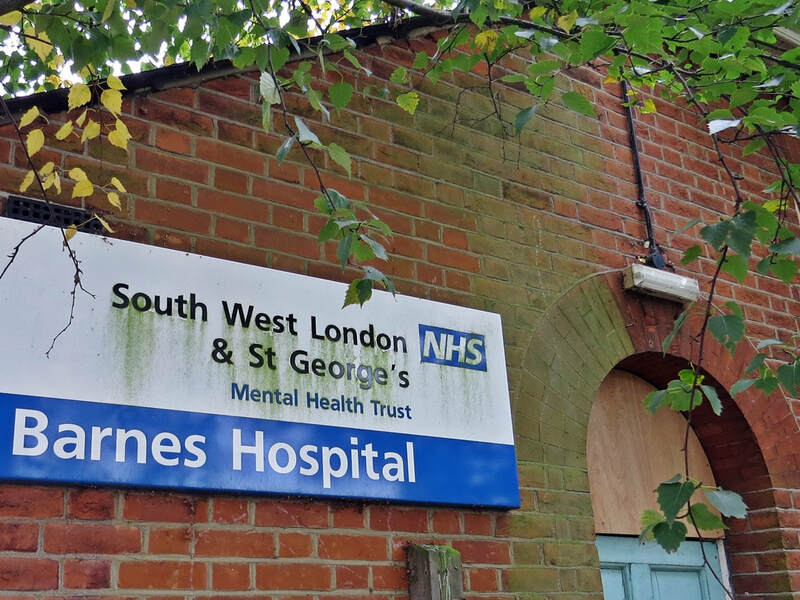 Mental health inpatient services have not been provided at Barnes Hospital since 2013 and the site is significantly underused, with approximately only 25% of the site currently in use to provide healthcare services. 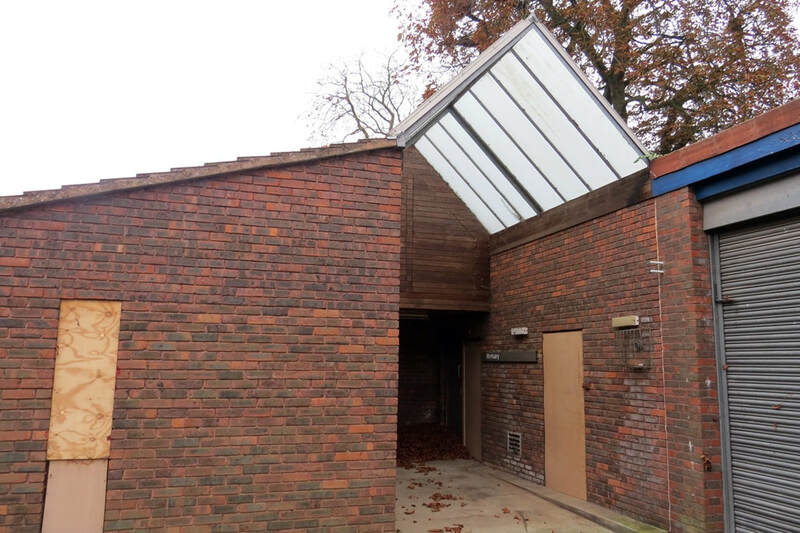 Some buildings were renovated in 2001 & a new extension was added. 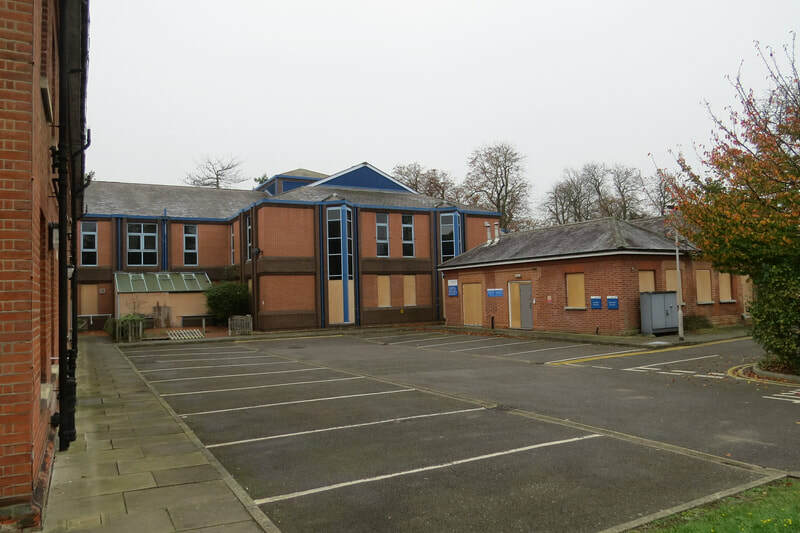 The remaining buildings have been deemed unsuitable for modern mental health inpatient services and many old buildings are now vacant.The NHS Trust Trust will be retaining part of the site and this will be used to continue to deliver the existing mental health services at Barnes Hospital plus releasing the remainder of the land to a mixed-use development of 90 new build apartments and a Special Educational Needs School. This disused tunnel under the railway line once connected Dulwich Hospital with St Francis Hospital. 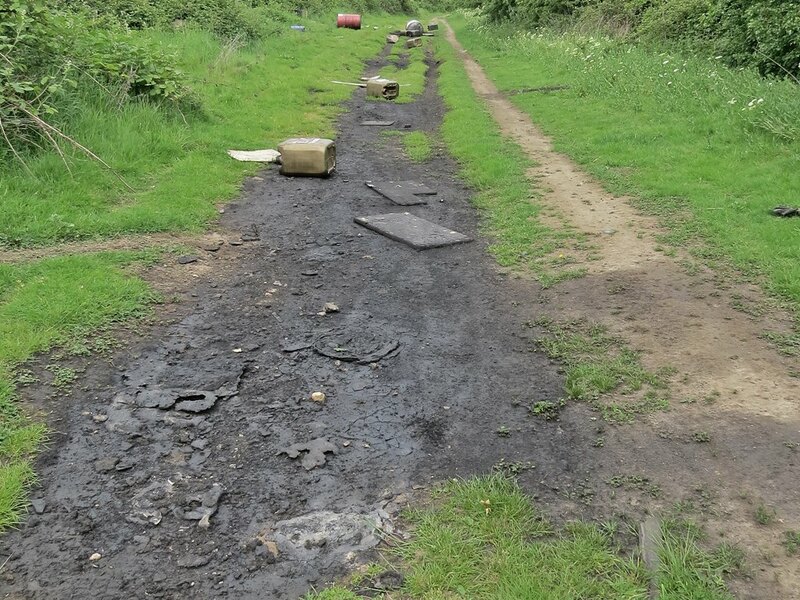 This saved time going by road, the stretchers on wheels had large pneumatic tyres to cushion to ride on the uneven pathway. Dulwich Hospital (originally St Saviour’s Union Infirmary) still exists (and in use as a hospital) but St Francis Hospital (originally the Constance Road Workhouse of the Camberwell Union) was demolished in 1993 and a housing estate now exists on the site -this is the estate that you see next to Dulwich Hamlet FC. 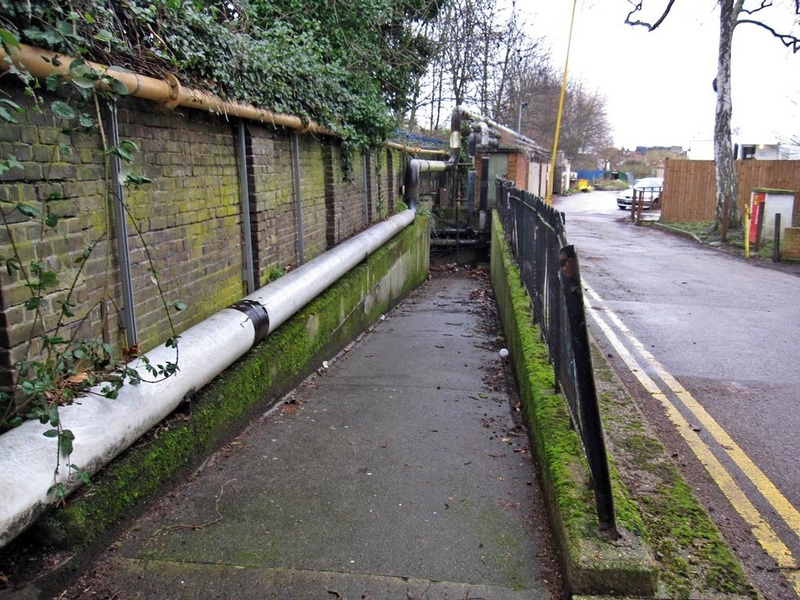 You can still find the entance of the tunnel from the back of Dulwich Hospital & even walk through the tunnel and up the slope the other end but then you reach a garden fence. 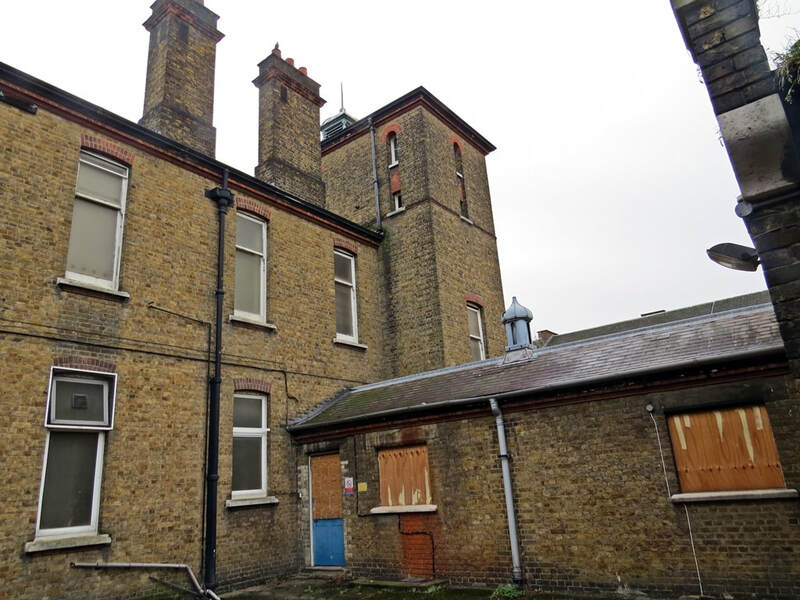 ​The Woolwich, Plumstead & District Cottage Hospital opened in 1890 but only had 12 beds.The hospital was considered too small and patients were transferred to the nearby Woolwich & District War Memorial Hospital when it opened in 1928. 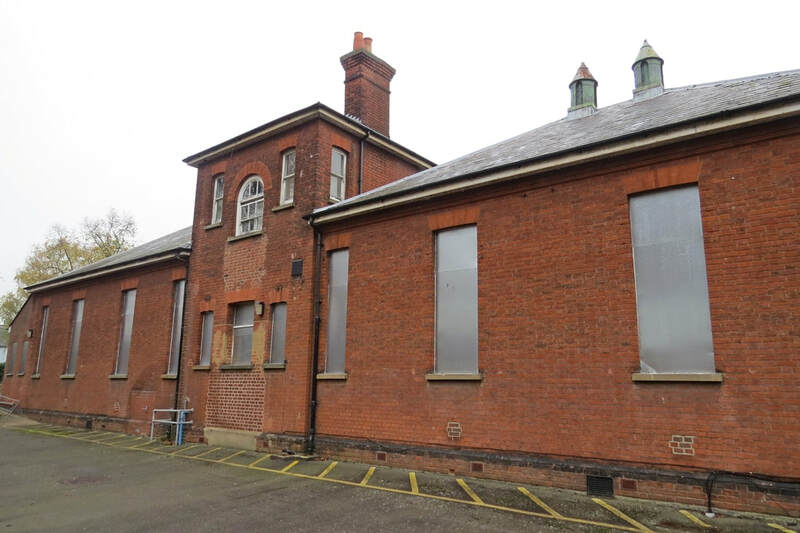 The Old Cottage Hospital (as it was by then renamed as) was then used as staff accomodation and following repairs to WW2 damage it was used as a rehabilation centre and renamed Castlewood Day Hospital, a day centre for people with mental health problems, during the 1960 and remainined in use until 2004 when the site was sold to developers. 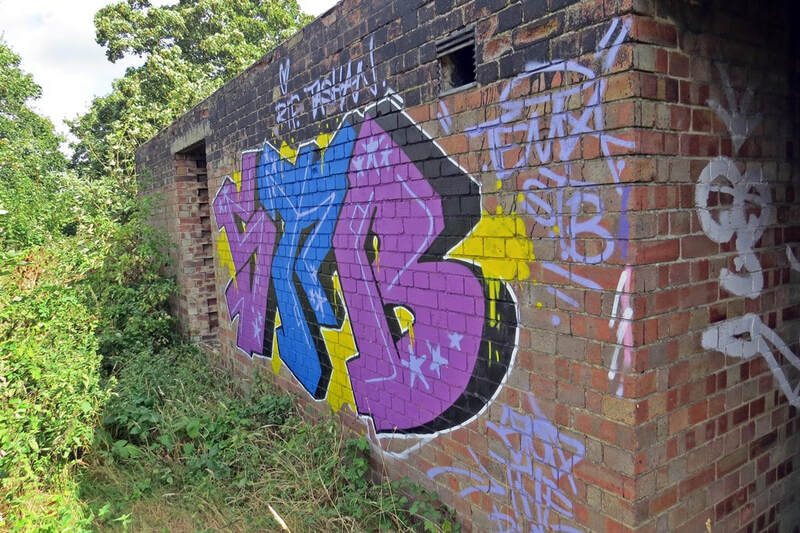 The building lay derelict and vandalised until 2011 when it was converted into flats with some new build houses to the rear. 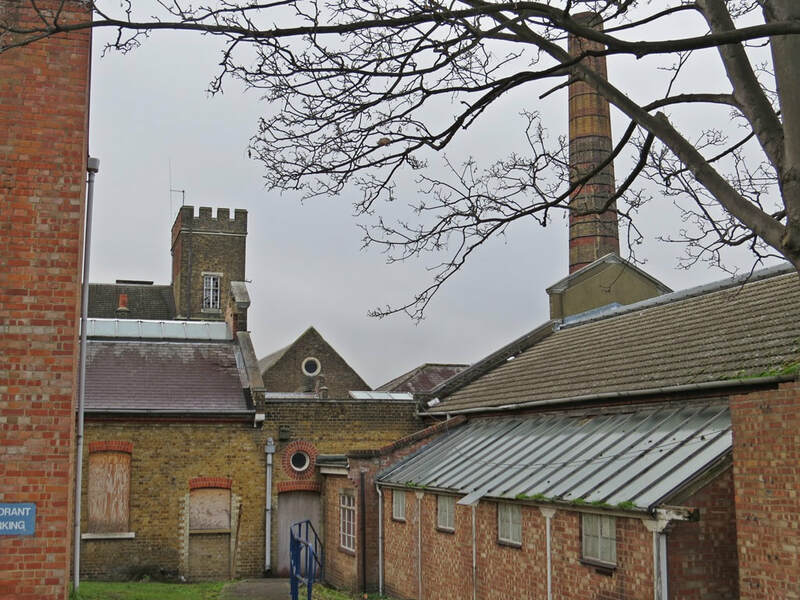 After the abolition of the Board of Guardians in 1930, the workhouse was taken over by the County Borough of Croydon. 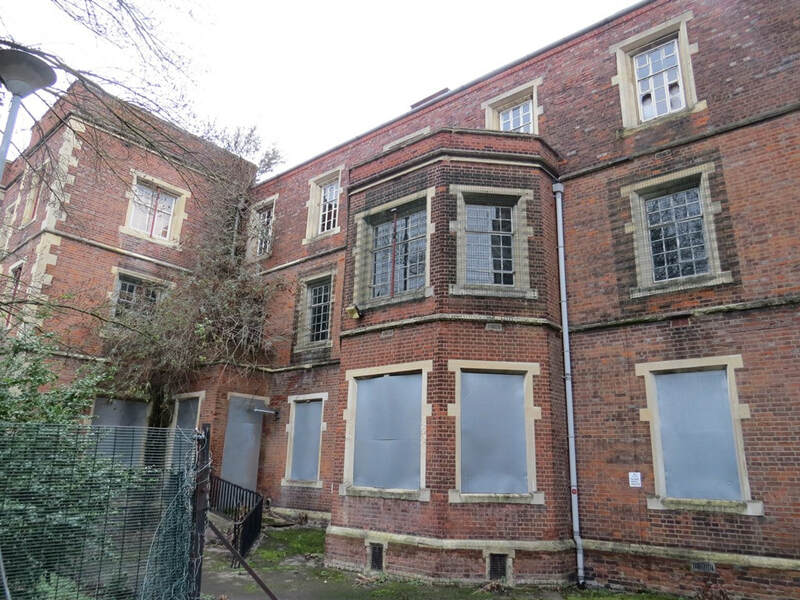 It continued to perform the same functions as the workhouse, though with a growing emphasis on the care of the elderly. 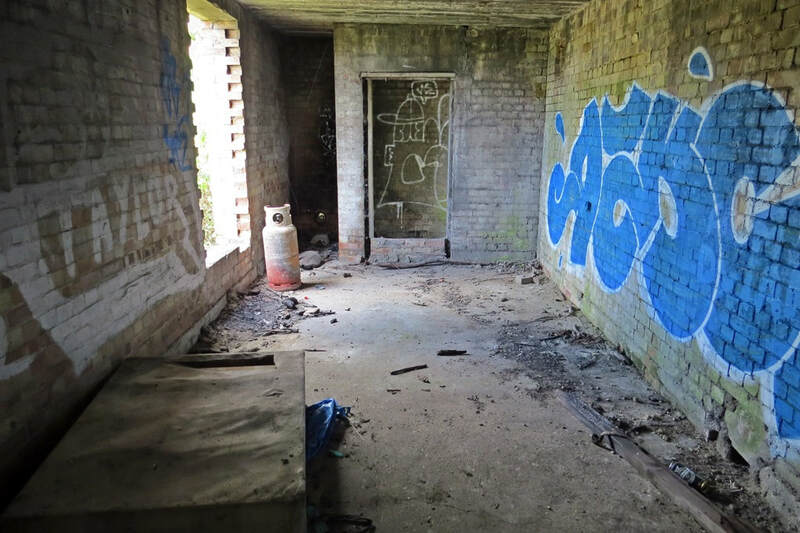 During the Second World War it was reclassified as a Class 2 Hospital under the Emergency Hospital Scheme, and was severely damaged by bombing in 1941. 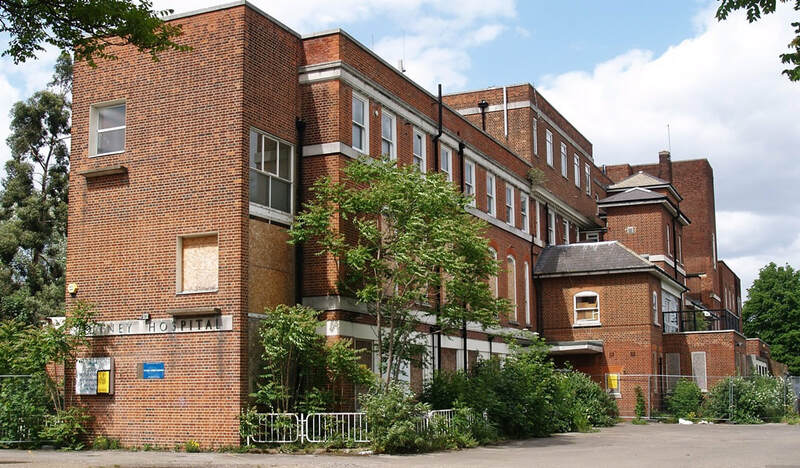 It was taken over by the National Health Service in 1948, when it was renamed Queen's Hospital, and became a geriatric hospital. 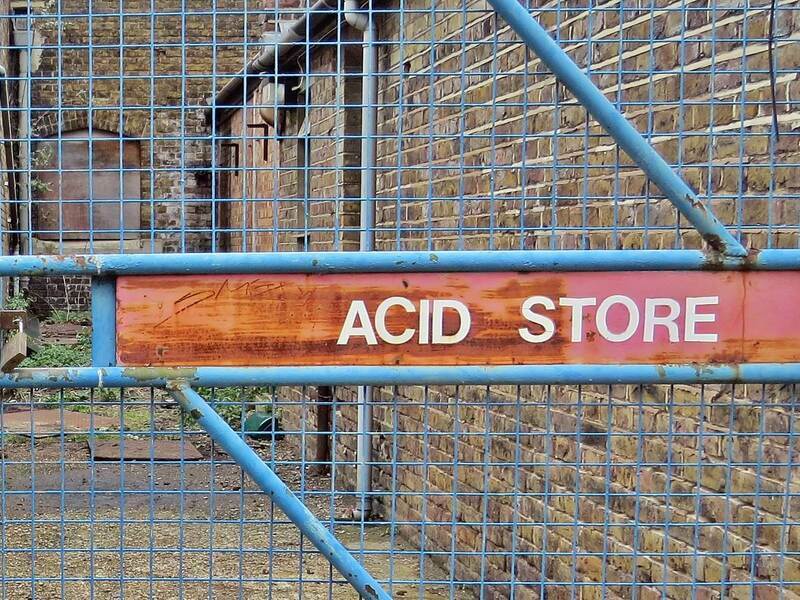 It closed in 1987. 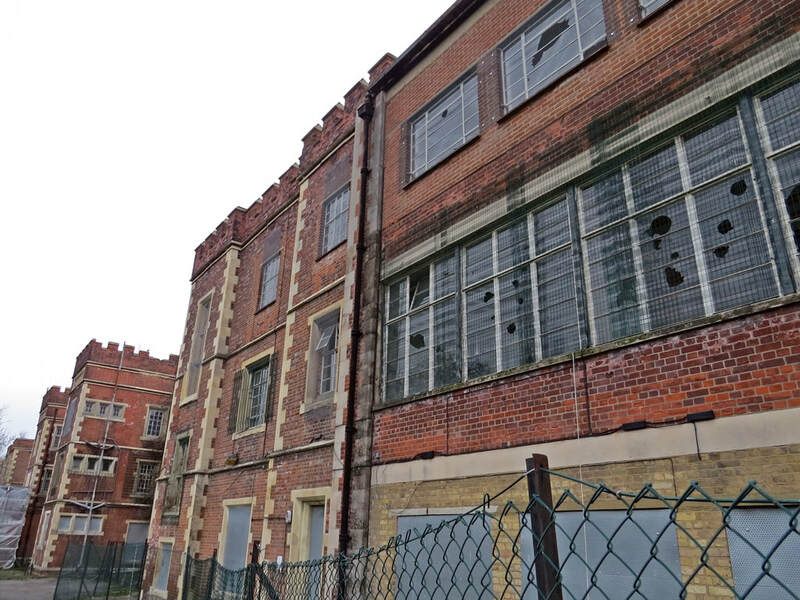 The buildings have all been demolished apart from the entrance block with it's 50ft listed tower and new homes constructed to the sides and rear of the site. 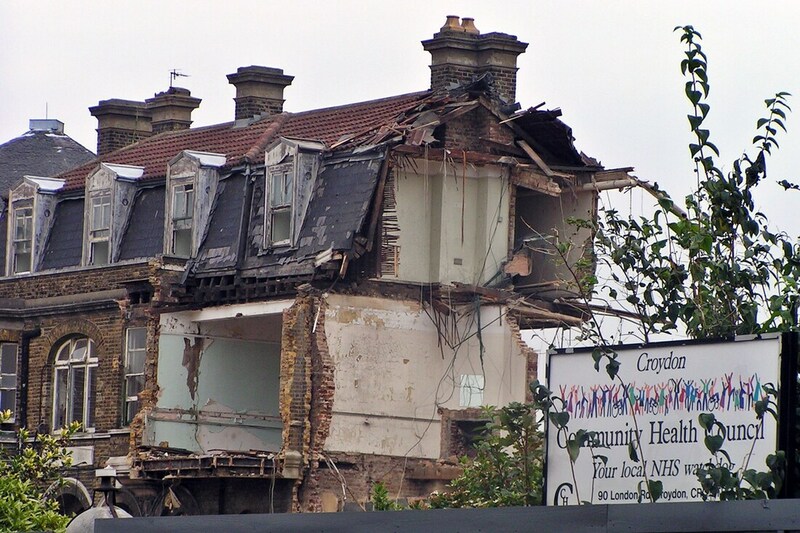 I found out about this place too late - just as the demolition had been completed. 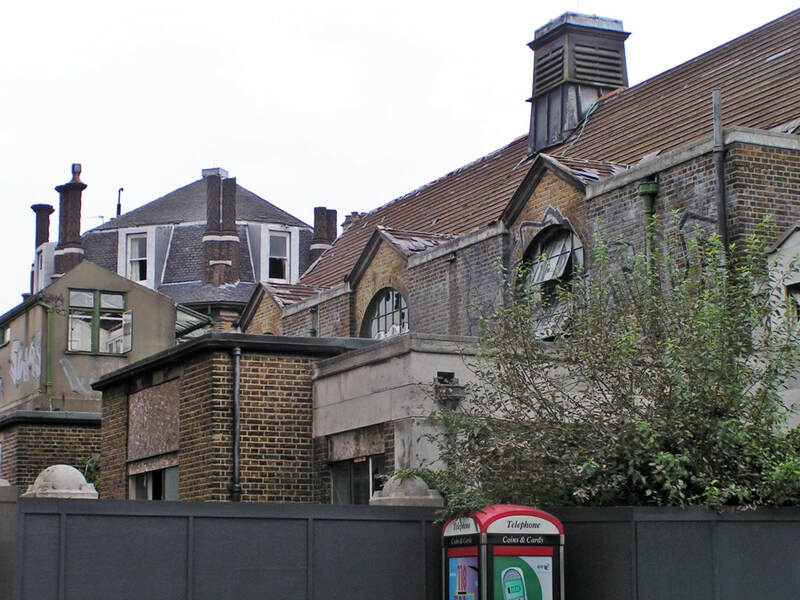 The 1962 Hospital Plan for England and Wales proposed that St. Alfege's Hospital, Greenwich should be redeveloped to form a District General Hospital of 800 beds. In 1963, the Minister of Health gave a press conference at which details of the new Greenwich District hospital were released. 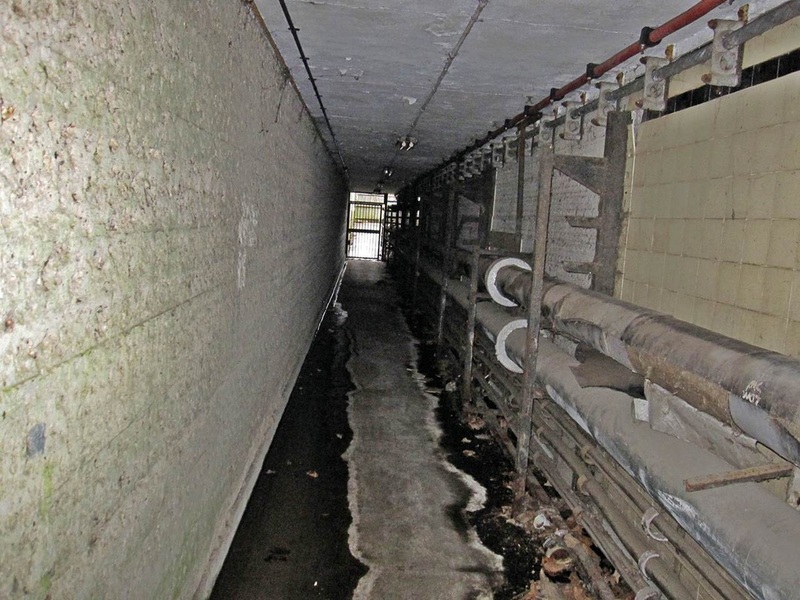 The main problem was how to fit an 800-bed hospital onto a site of less than 8 acres. 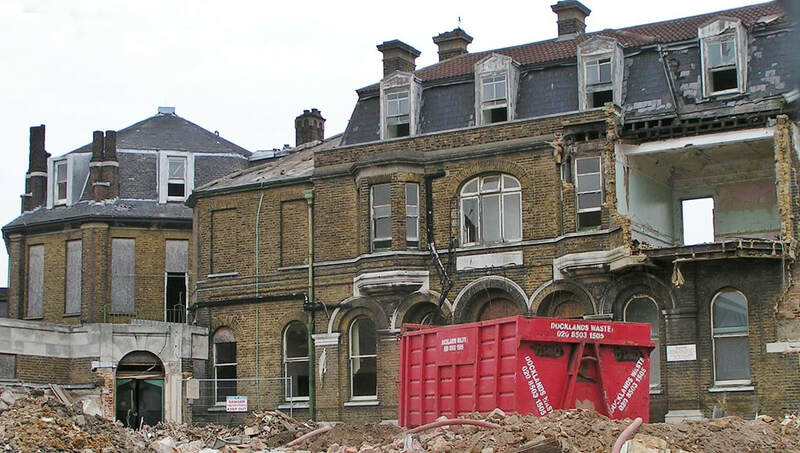 In order to keep the hospital in continuous operation the old buildings of St Alfege's were gradually demolished from 1965 and new ones built in phases. The construction methods was revolutionary - all lateral engineering services were contained in a 6-foot gap between floor and ceiling of each pair of floors so that repairs and maintenance works could be carried out without disturbing ward or department routine. 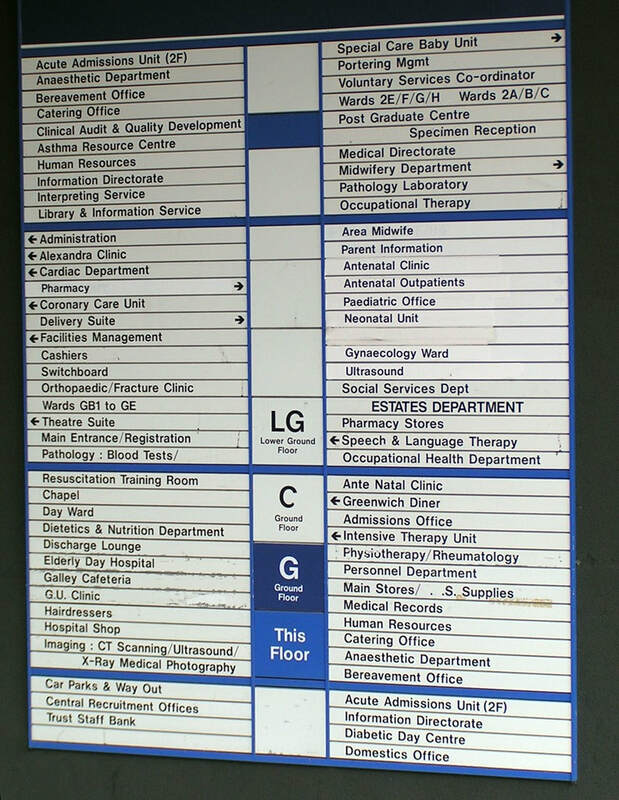 All wards had natural light but the service departments e.g. 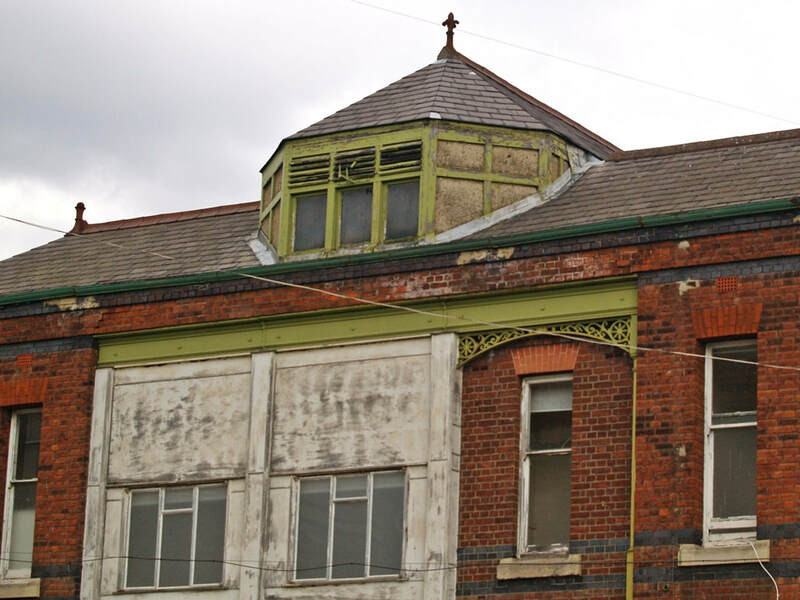 x-ray, pathology and operating theatres would be in the centre and artificially lit. 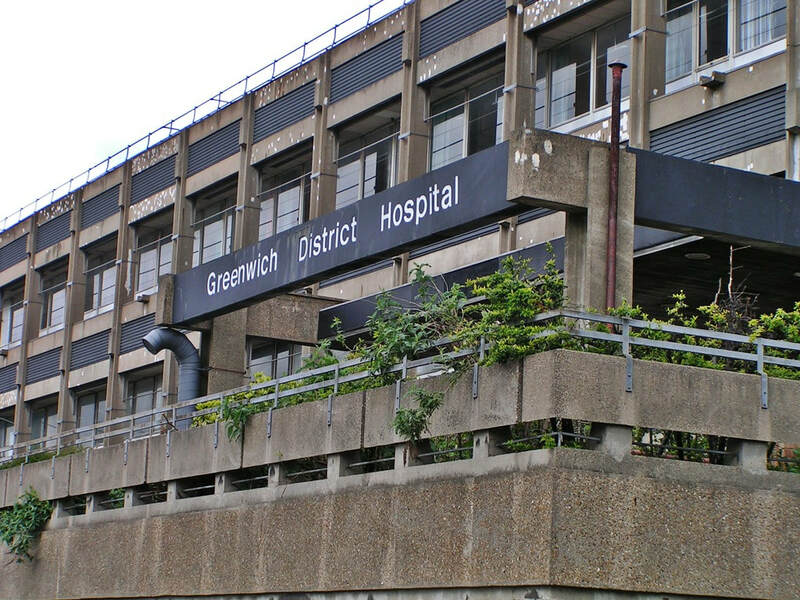 The hospital renamed Greenwich District which opened in 1972 was ventilated mechanically and none of the windows would open so that the air in the wards would be as ‘pure’ as possible. 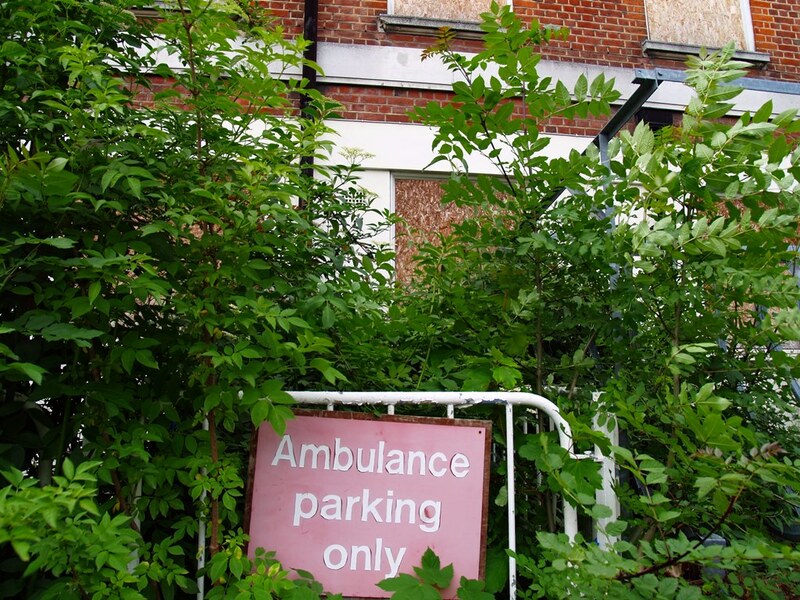 The hospital was closed down in 2001. 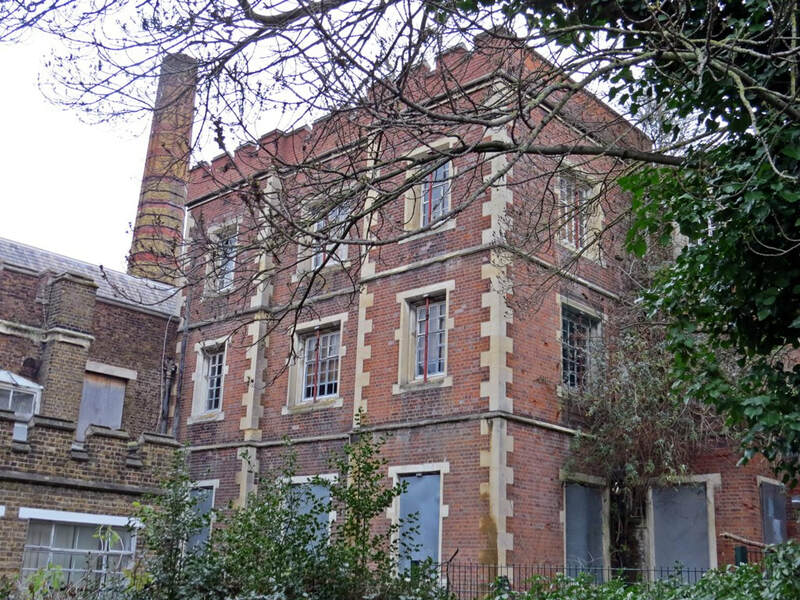 Scenes from the film "About a Boy" starring Hugh Grant were filmed at the former Greenwich District Hospital. 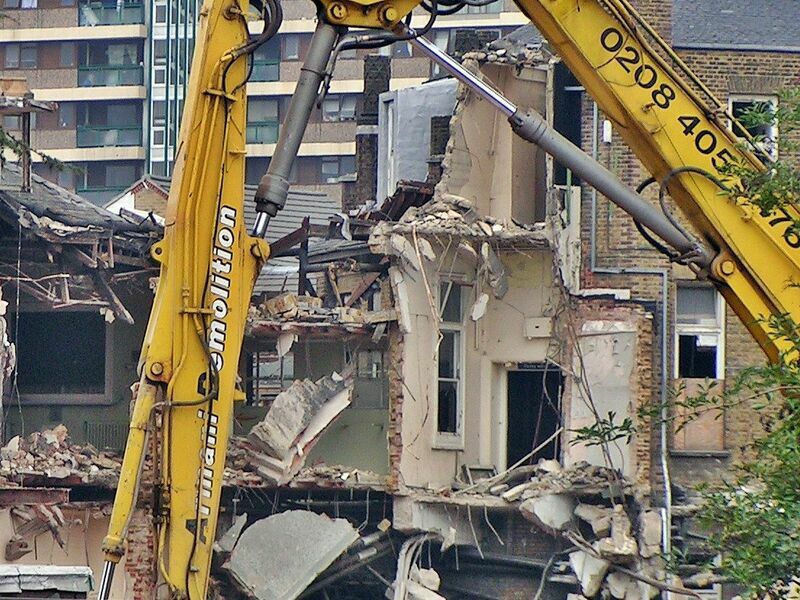 All the buildings were demolished in 2006 and the land lay vacant until building work started c2013. 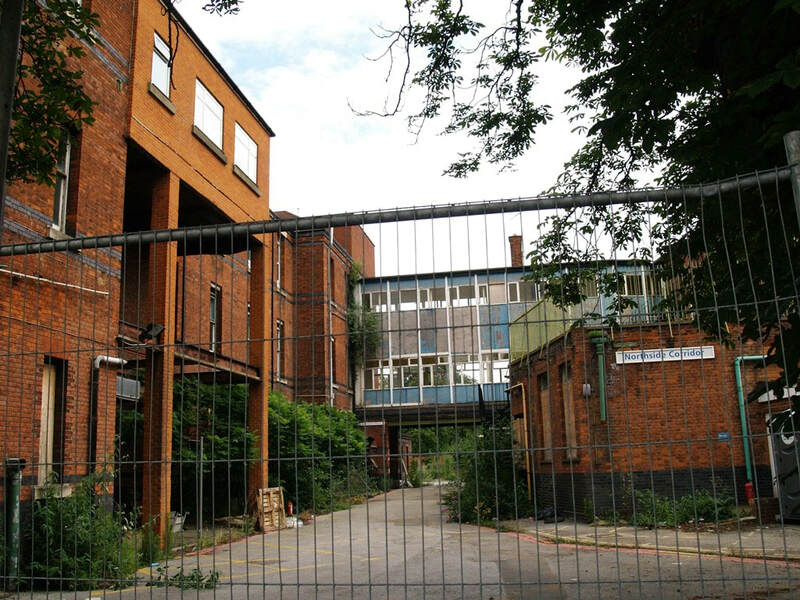 A health centre, sports centre and housing now occupy the site. ​Built in 1895 and originally used as a court house. 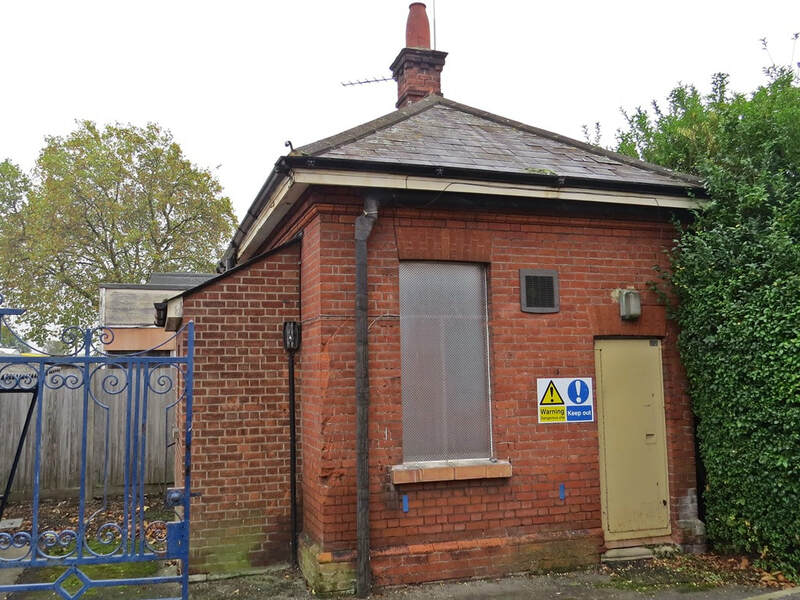 The Level Crossing Centre was a drop in centre for people with learning disabilites. 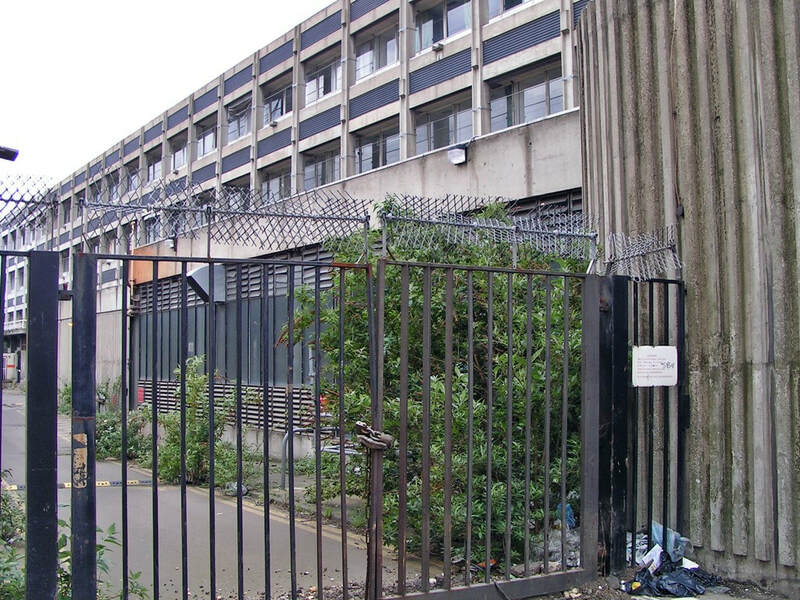 In 2010 it was squatted and became the System Xchange Social Centre. 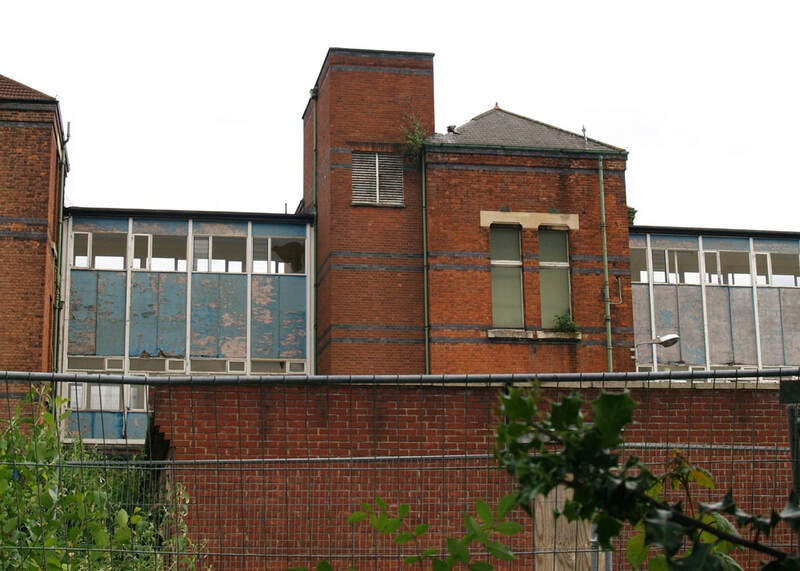 The building has now been converted into Thomson House School. 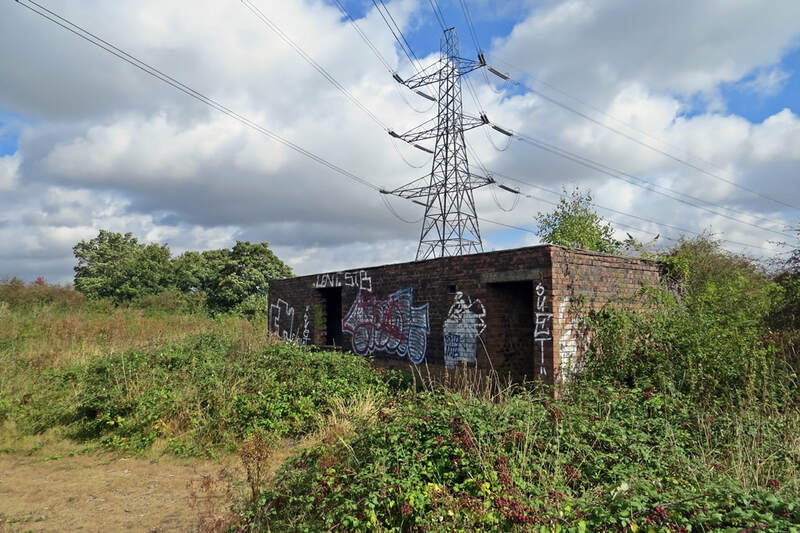 Debbie who worked at the Level Crossing Centre writes to Derelcit London: "The building was grim inside (although quite ok looking from the outside) and was going to cost a fortune to refurbish it so it was closed and the services there moved elsewhere." 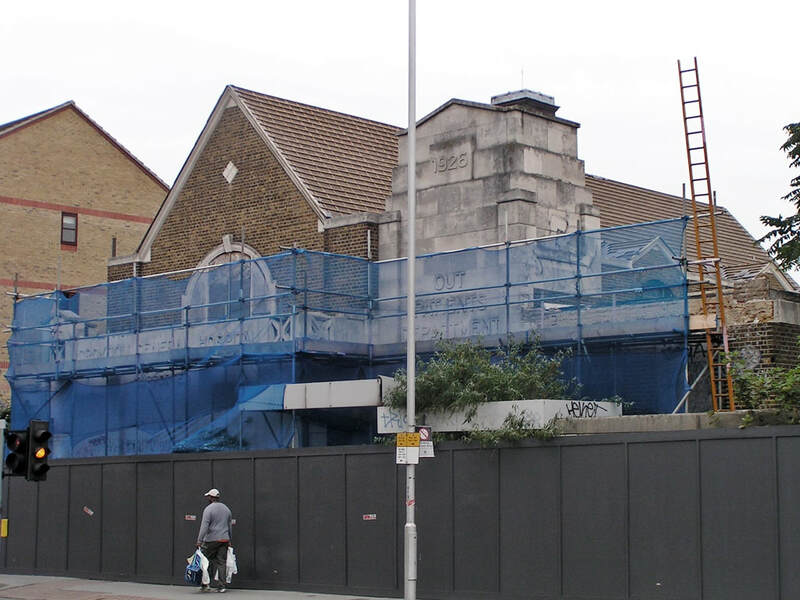 This unremarkable building overlooking the Thames has now been demolished. 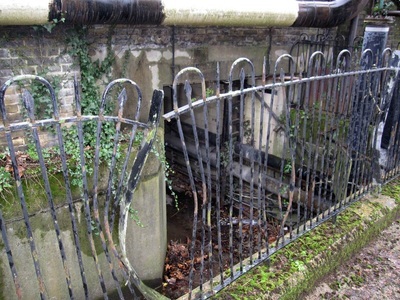 A hospital stood here since 1912 when it moved here to Rothbury House and then known as the Chiswick Cottage Hospital. 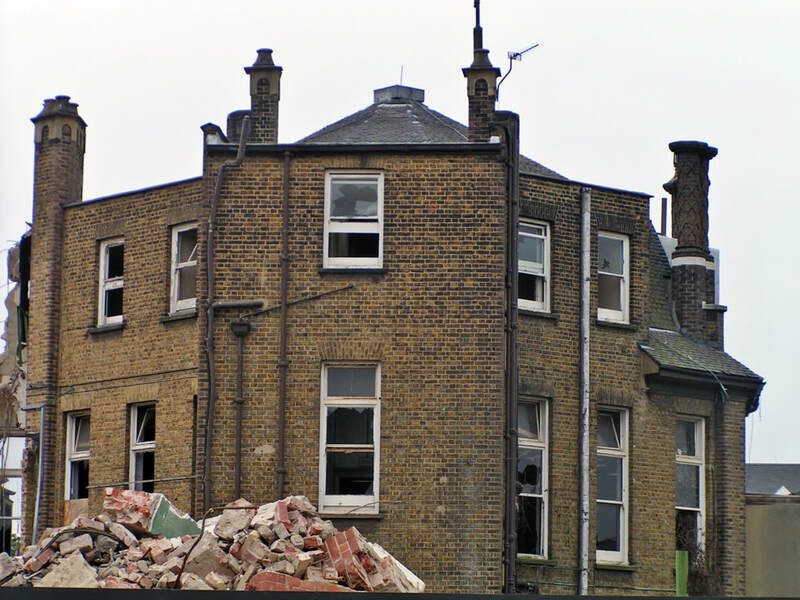 By the time Rothbury House was 150 years old it was decided to demolish it in 1935 and rebuild on the same site though the war delayed things and the hospital reopened in 1943 as a maternity hospital . 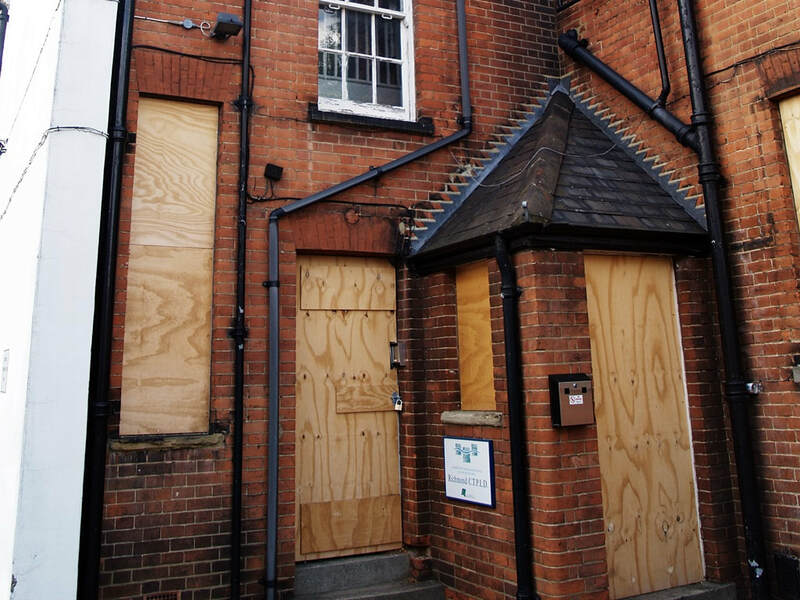 Both Pete Townsend and Kim Wilde were born here. 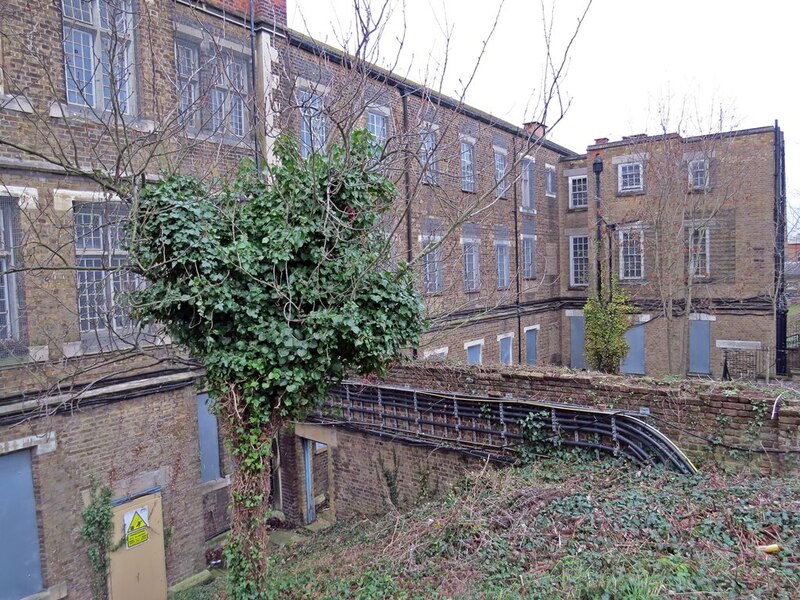 It closed in 1975 and used for Charing Cross Hospital medical staff accommodation and was also regularly used by TV companies and was used in the filming of once popular programmes The Chinese Detective, Angels, Not the Nine O'Clock News and Bergerac. 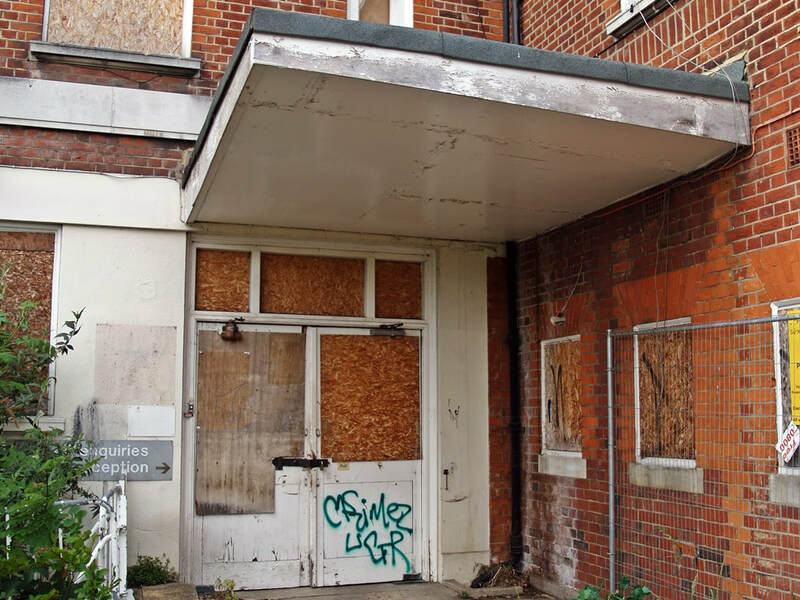 From 1984 (after refurbishment) to 2006 the building was known as Chiswick Lodge and used as a hospital mainly for older people with dementia and was pretty grim apparently according to an ex member of staff who wrote to this website. 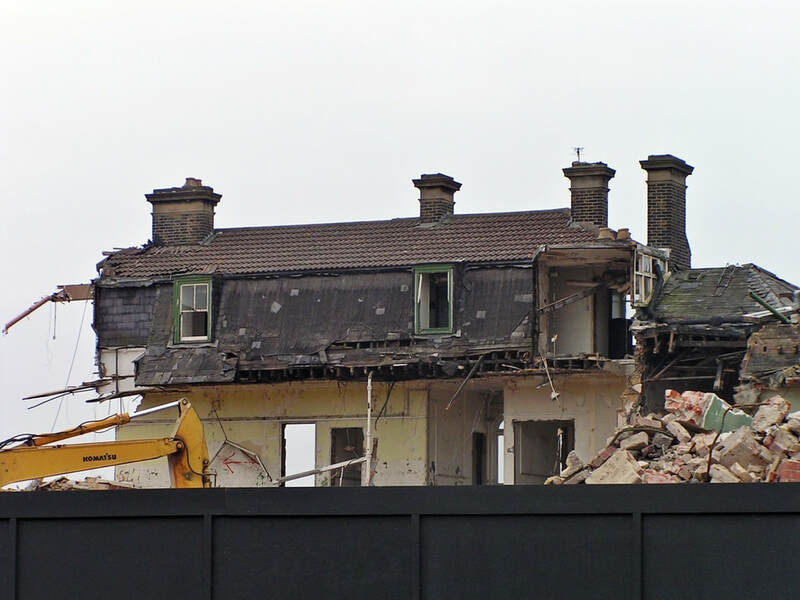 The hospital has now been demolished and has been replaced by a development consisting of a 4 storey terrace houses. 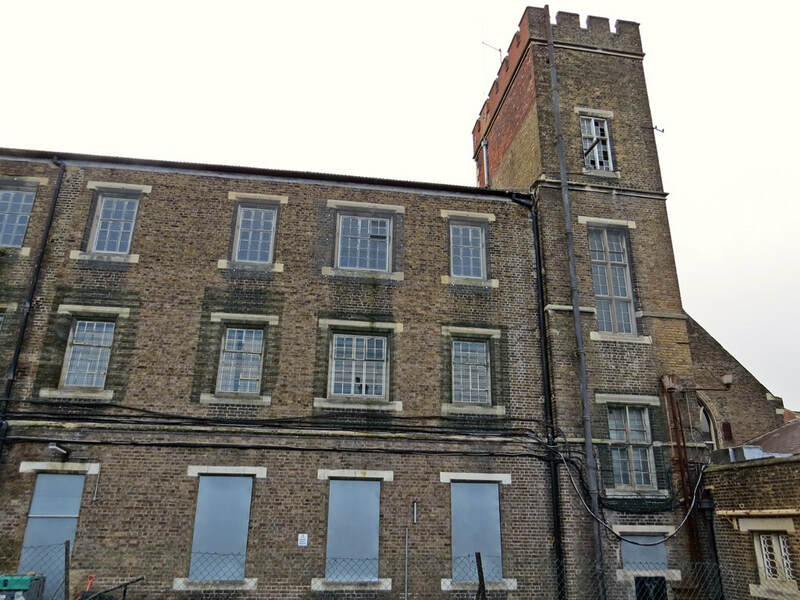 ​Originally opened as the New Brentford Workhouse in 1902, the buildings became the West Middlesex Hospital in the 1920s. 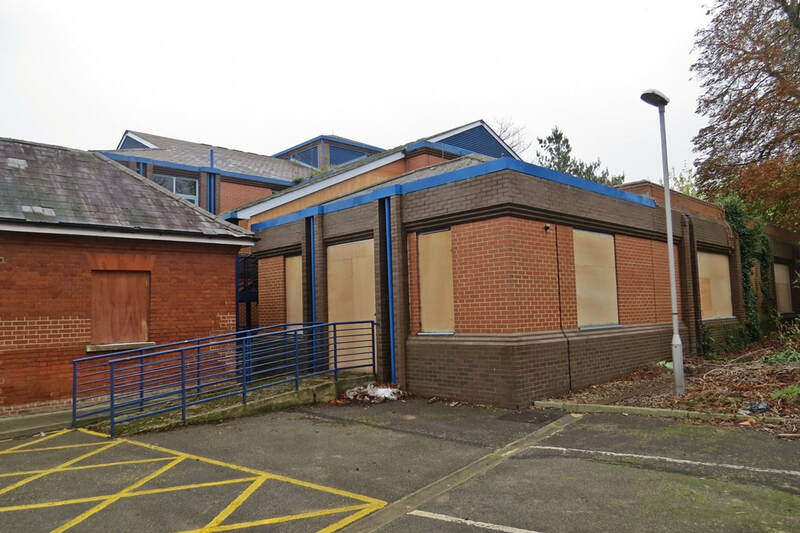 During the 1990s the hospital cared for more than 124,000 out-patients a year, as well as dealing with 16,000 planned admissions and delivering, on average, five babies a day. 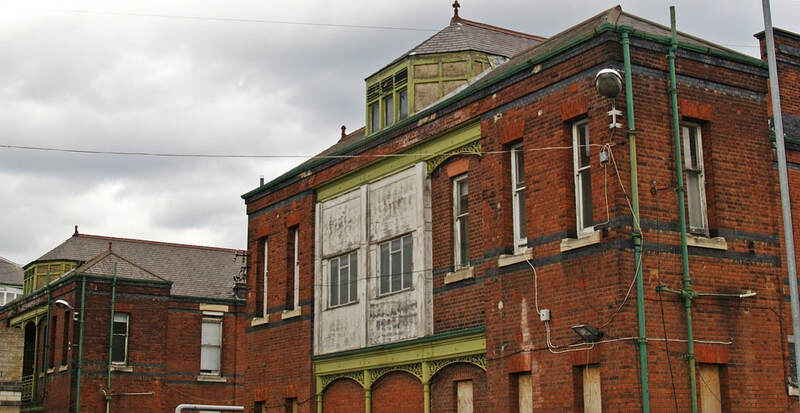 But the dilapidated Victorian buildings were proving expensive to maintain and were felt to be adversely affecting the level of care on offer. 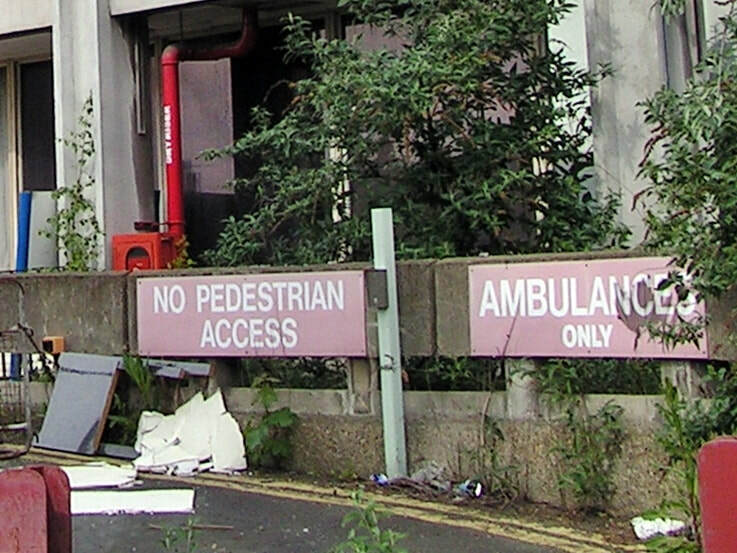 In 2003 new hospital buildings were built adjacent to the site and these ones remained derelict until demolition in 2008. 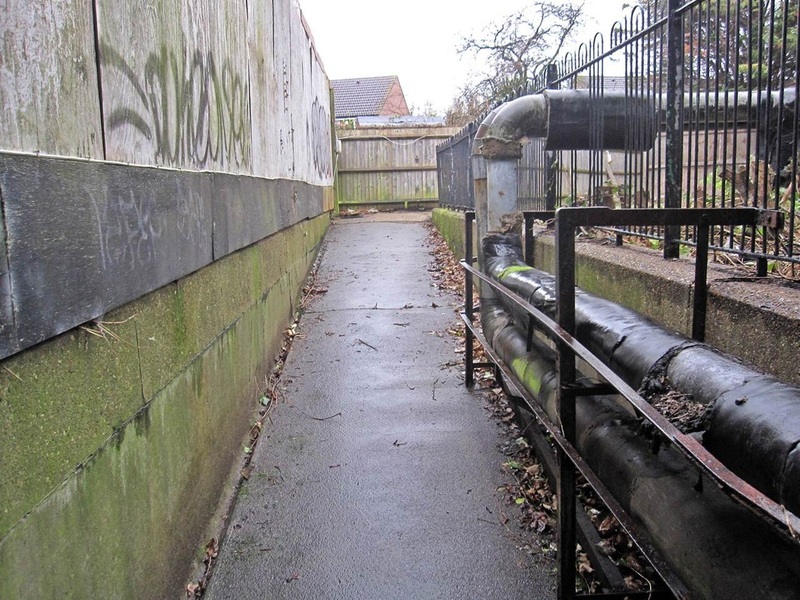 All the pictures here taken in 2008 show the site just before demolition.This site has now been redeveloped into housing. 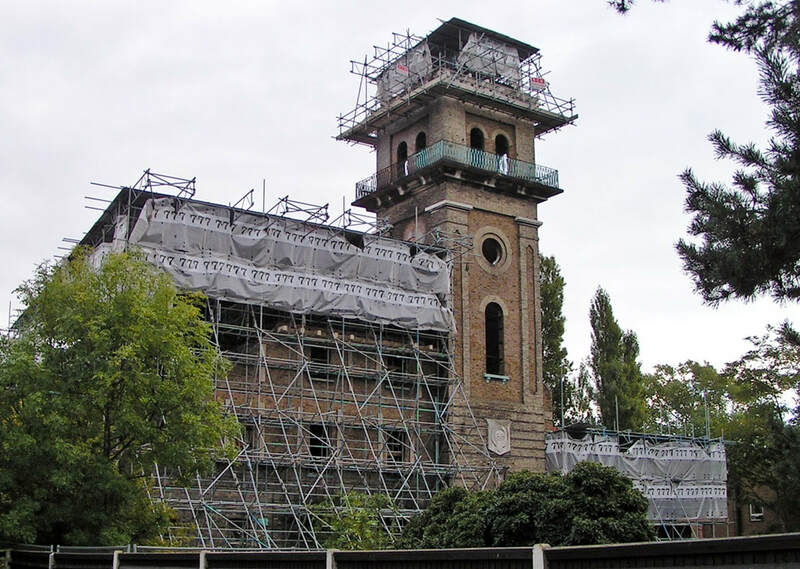 In 1900, Sir Henry Chester left £75,000 and Sir William Lancaster donated a site which resulted in Putney Hospital.The hospital has been empty since 1999 Its future use has been complicated by questions over where its boundaries with Putney Common lie and by the existence of a covenant. 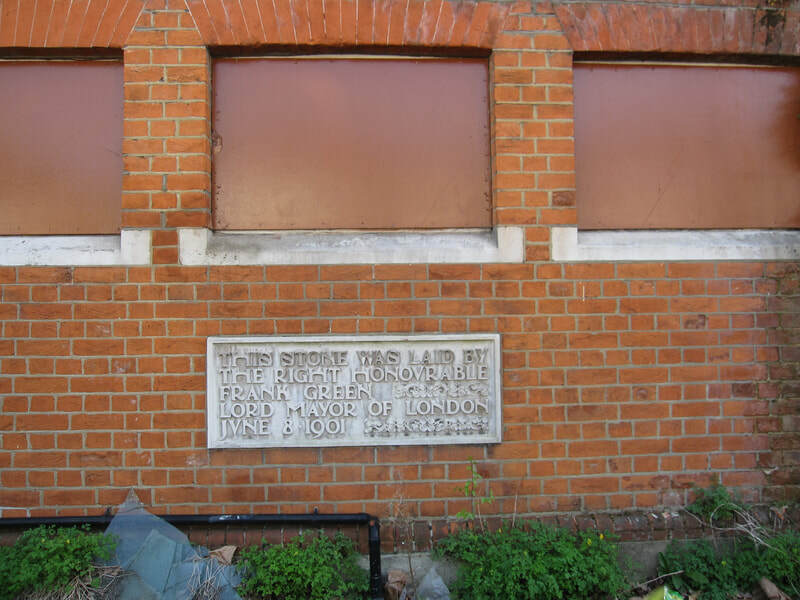 This states that the land, given to the people of Putney for a hospital 100 years ago, must not be used for any other purpose. 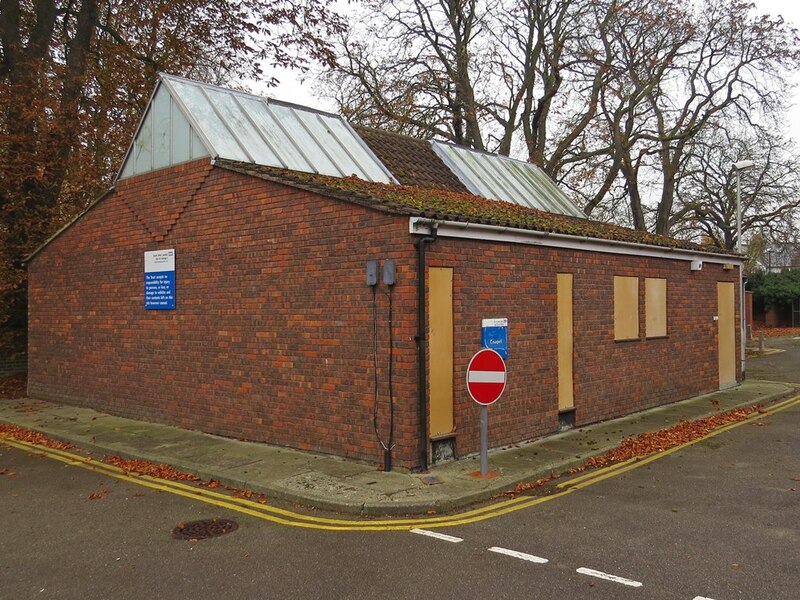 Subsequent reports said that the site had been announced as the chosen location for the new Putney Primary Care Centre which would house three Putney GP practices. 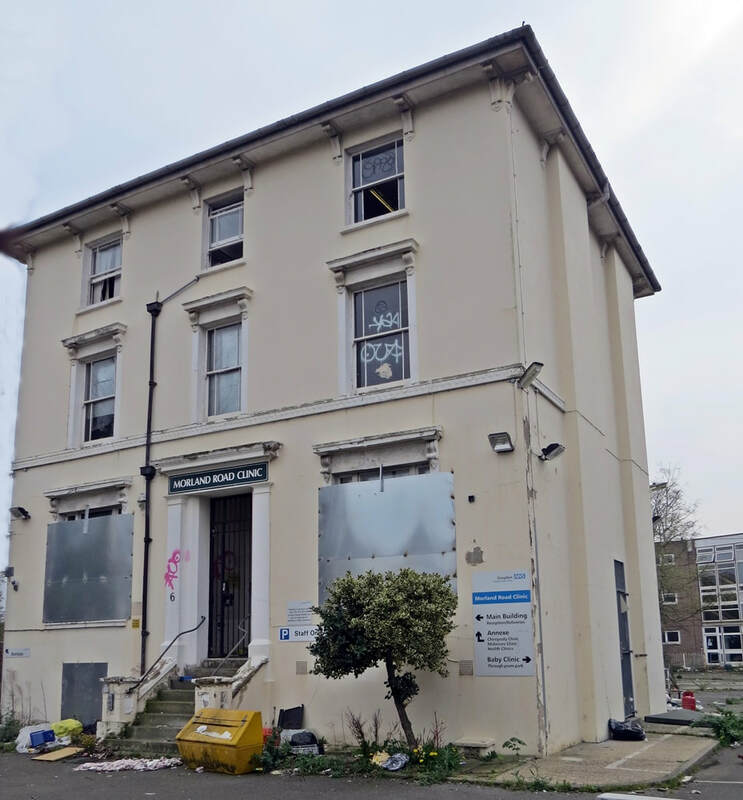 In 2009, the Wandsworth Guardian revealed NHS Wandsworth spent £2.6m in eight years on planning and securing the dilapidated hospital site. 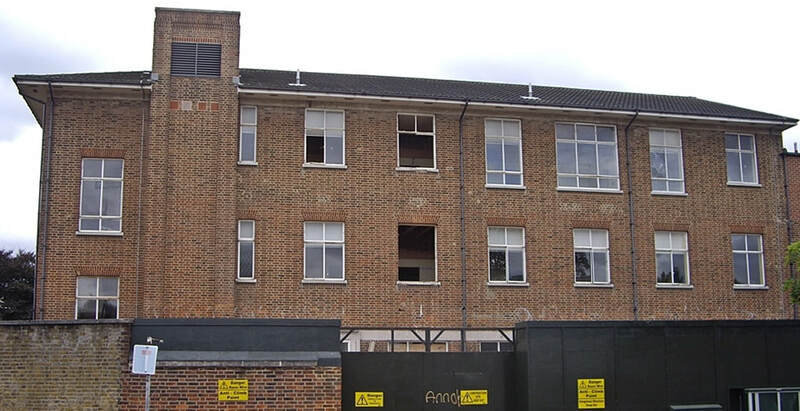 Despite the covenant the hospital was demolished in late 2012 and a school was built on the land alongside new build flats. 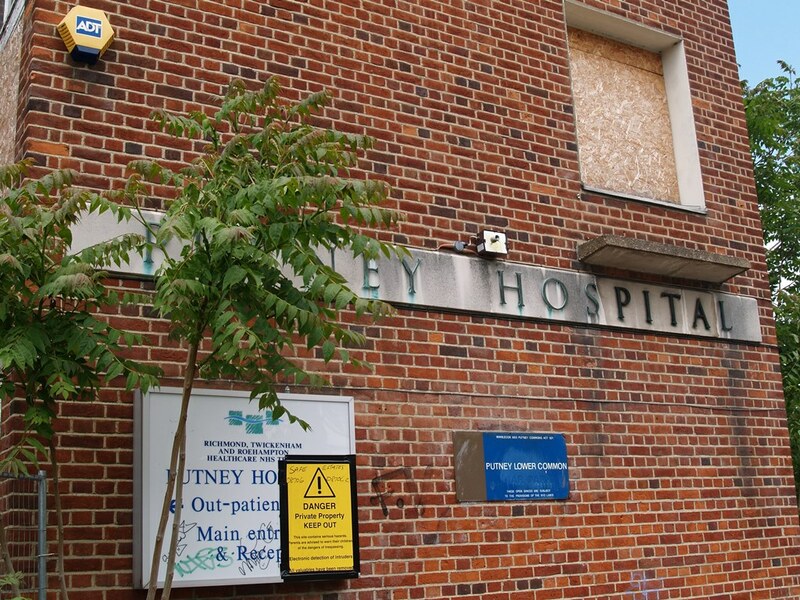 Scenes from the film "Nuns on The Run" starring Robbie Coltrane were shot at Putney Hospital. The nearby Barnes Common is said to be haunted by the spectre of a man dressed in convict’s clothing, including broad arrows, who is said to glide around the common as if intent on committing a crime. 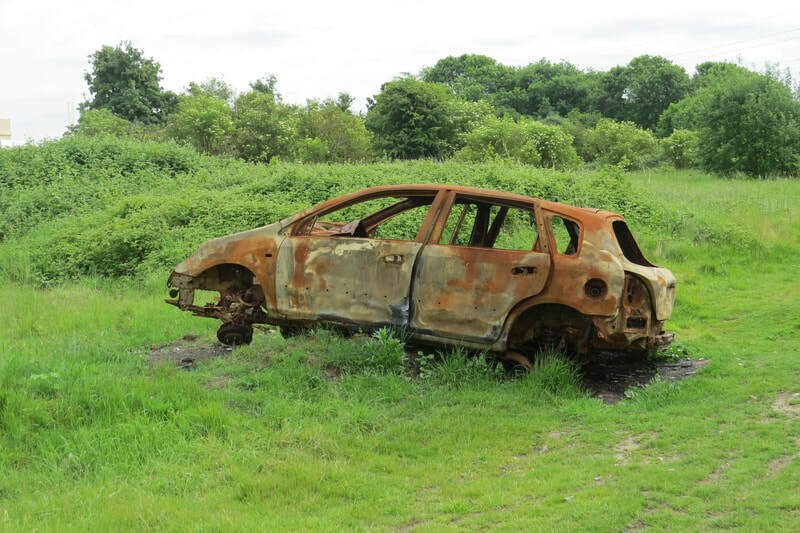 A man described how, whilst he was crossing the common one night, he saw the figure walk out of a pond and move noiselessly past him. 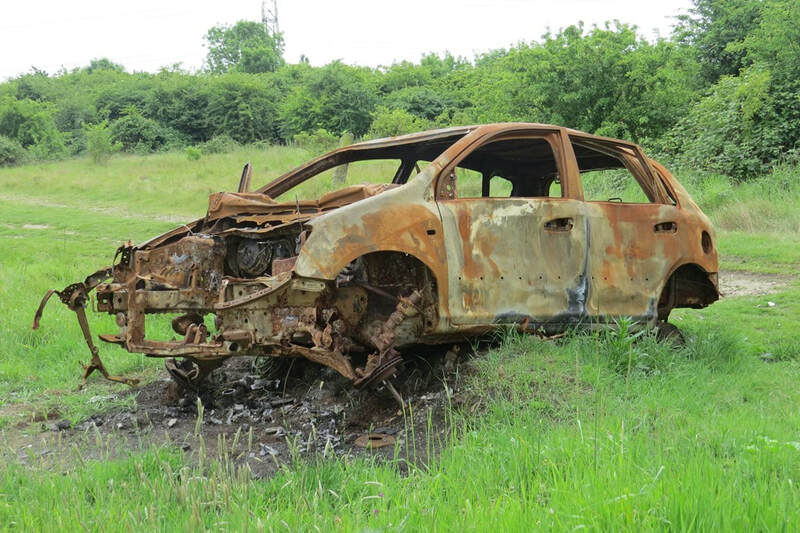 He turned round only to find that the figure had disappeared, although there was nowhere for him to have hidden. It is thought that the figure was the ghost of a convict who had escaped from nearby Putney Hospital, where he had been undergoing treatment, and had drowned in the pond whilst being chased across the common. 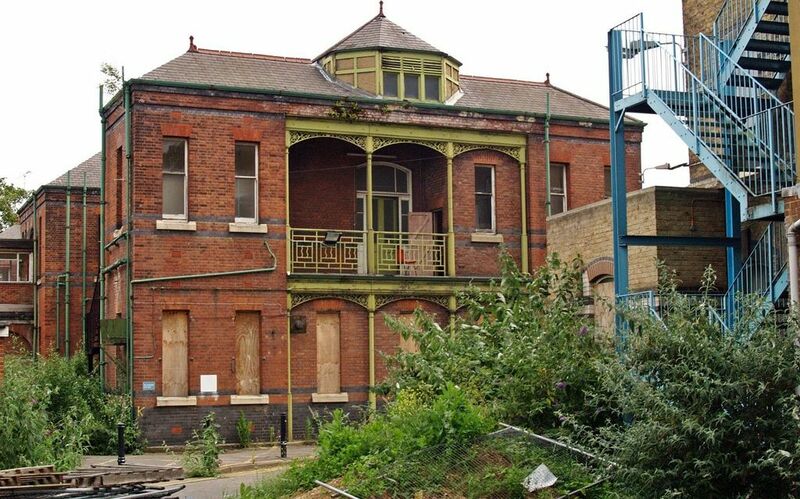 Croydon General Hospital first opened in 1867 on a site in South Croydon before moving to this old mansion called Oakfield Lodge, in 1873. 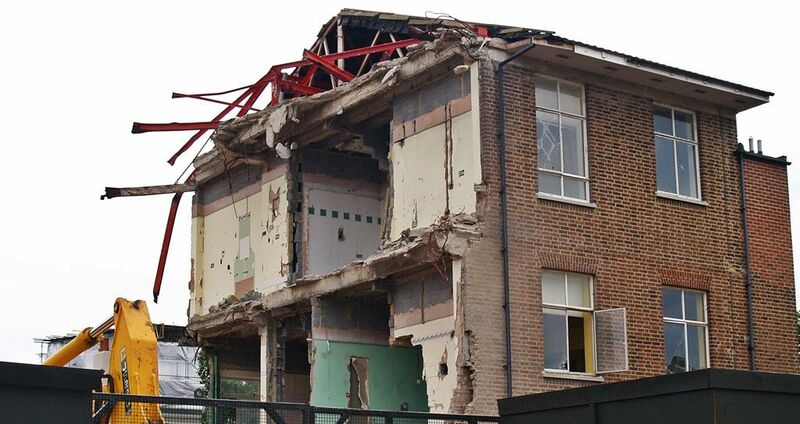 Many alterations and new wings were made to the old building over the years. 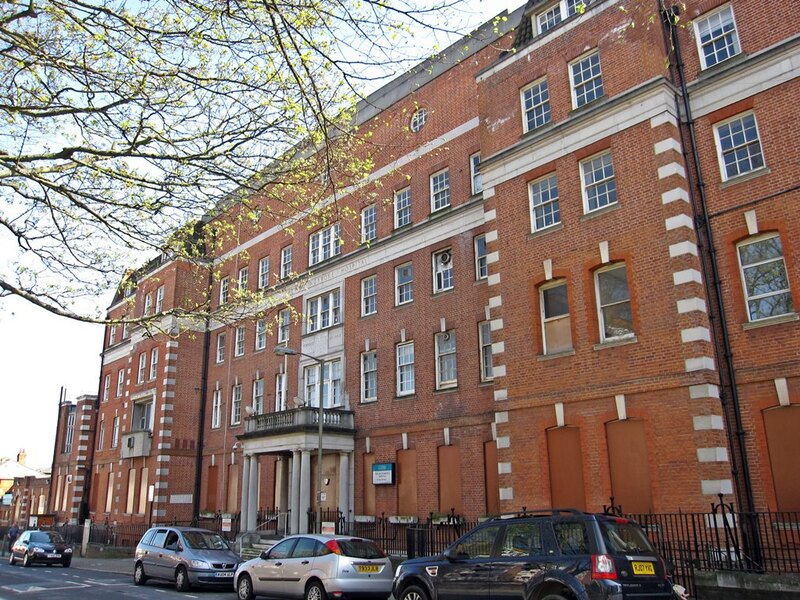 In 1916 the hospital received a Royal visit from King George V. By the outbreak of the Second World War in 1939, the hospital had around 250 beds though by the 1980s the amount of beds had reduced to less than 100. 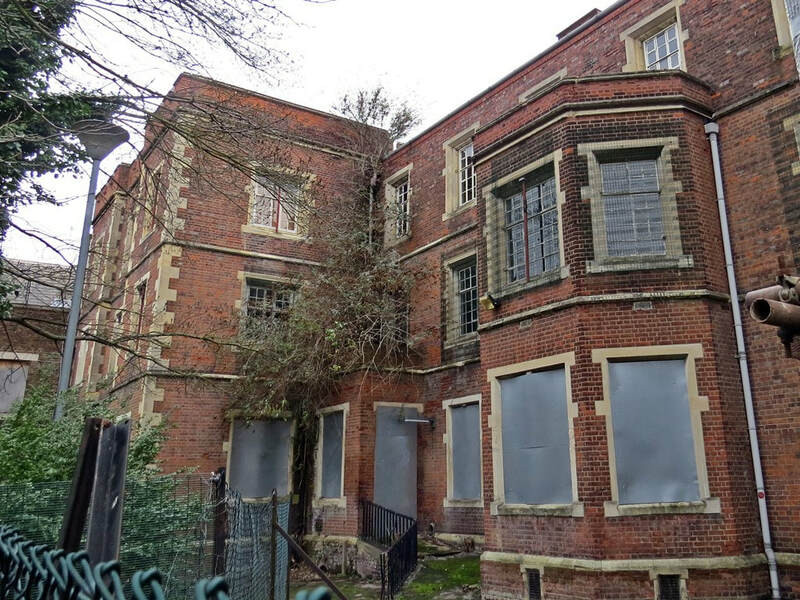 It closed in 1996 as the Croydon General Hospital building was condemned due to its age and state of disrepair. 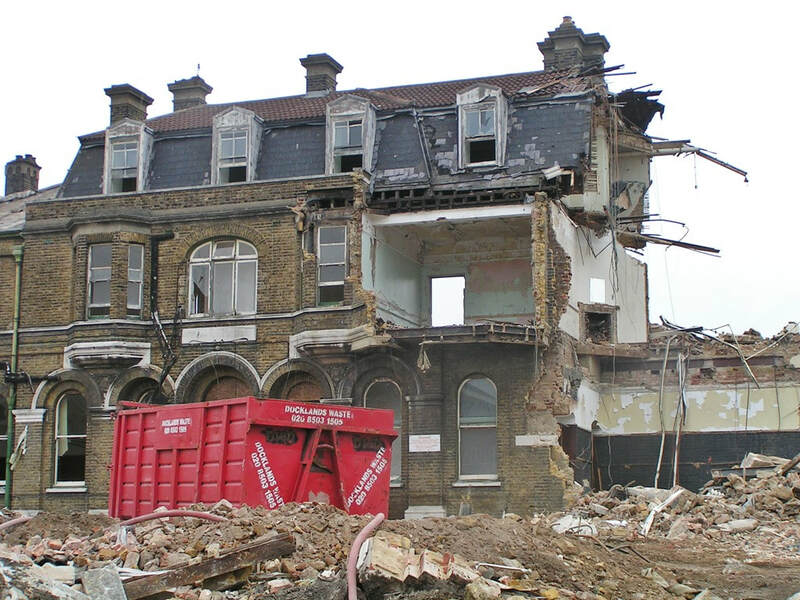 It was demolished in 2004.The demolition process was lengthy as most of the brick, timber and tiles was salvaged and sold to offset the cost of the demolition. 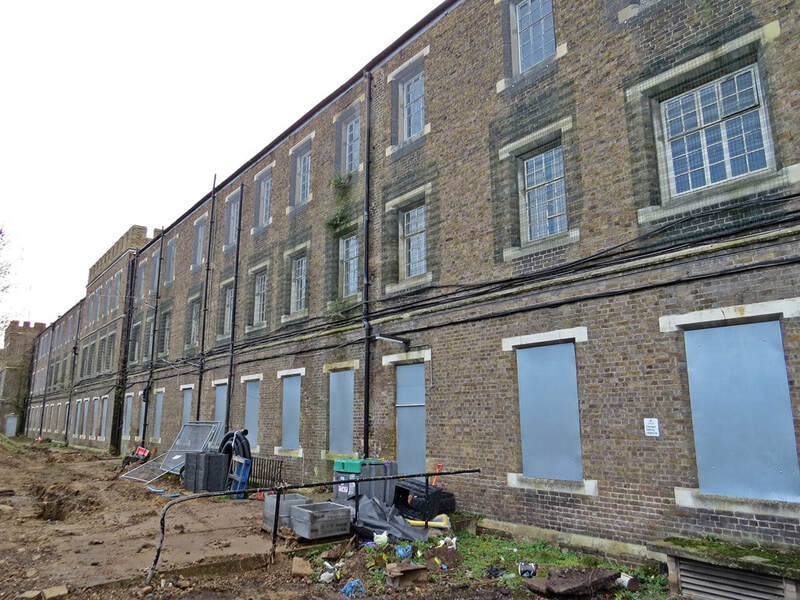 The land lay vacant until 2016 and a new secondary school, called Harris Invictus now occupies the site. 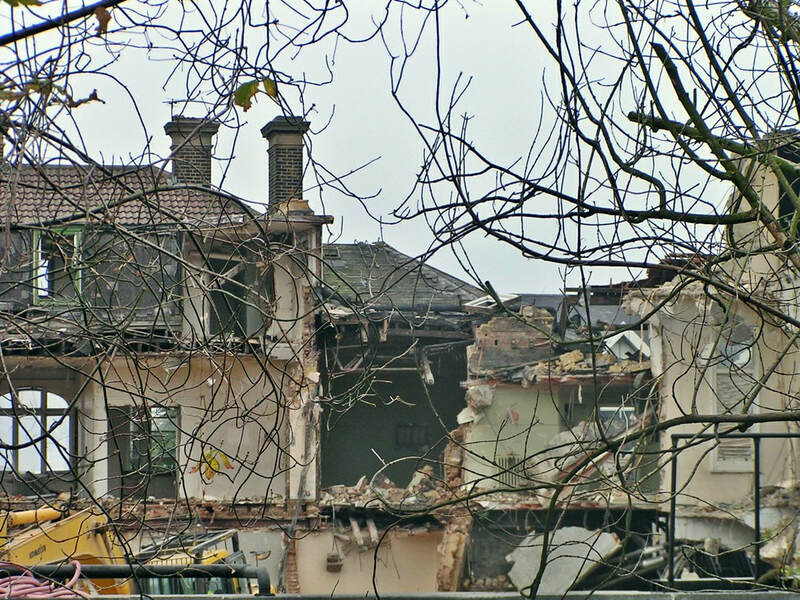 Some stone work from the existing building was at the time said to be conserved and incorporated into any new development though that doesn't to appear to have happened. 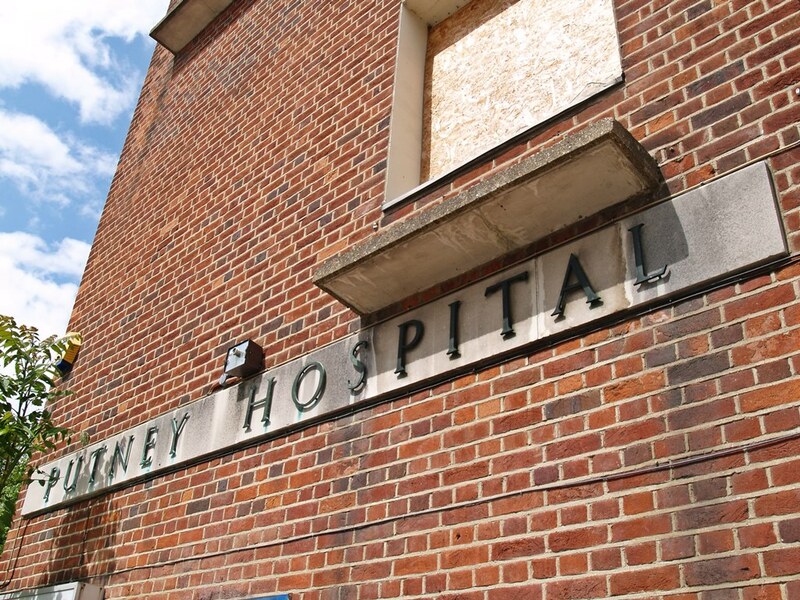 Barbara Lawrence writes: "My mother worked there as a nurse or nurse's aide in 1940. 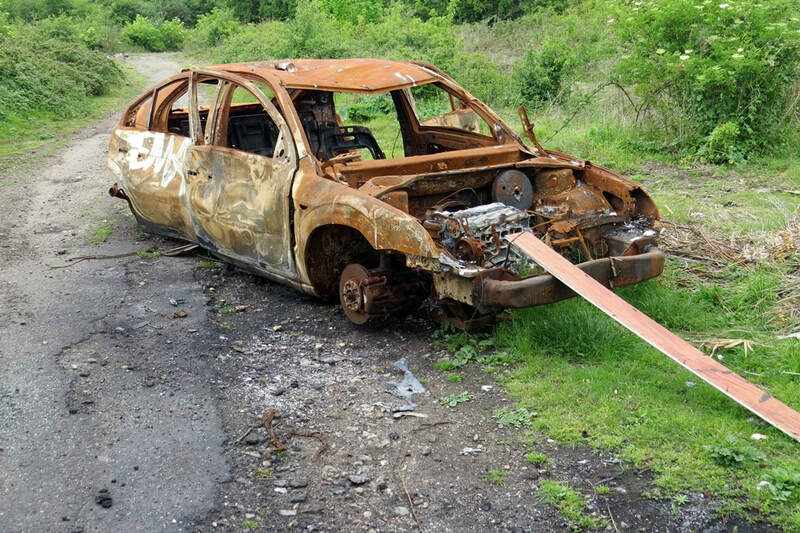 I'm trying to find out if the Nurses's Home was bombed, and if so when. My mother died in 1973, but I remember her saying that a bomb exploding near the hospital destroyed the nurses' home or dormitory and affected her hearing for the rest of her life I know she worked at Lambeth Hospital as well, and I have determined that the nurse's home there was bombed on January 11, 1941, but I think by that time my mother was working at Croydon. 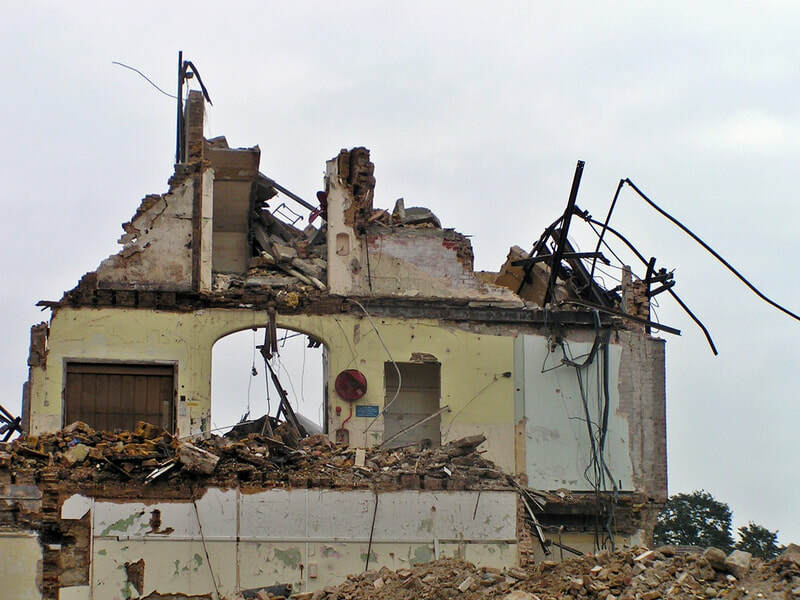 Thank you for the photographs and information on this site about the hospital. 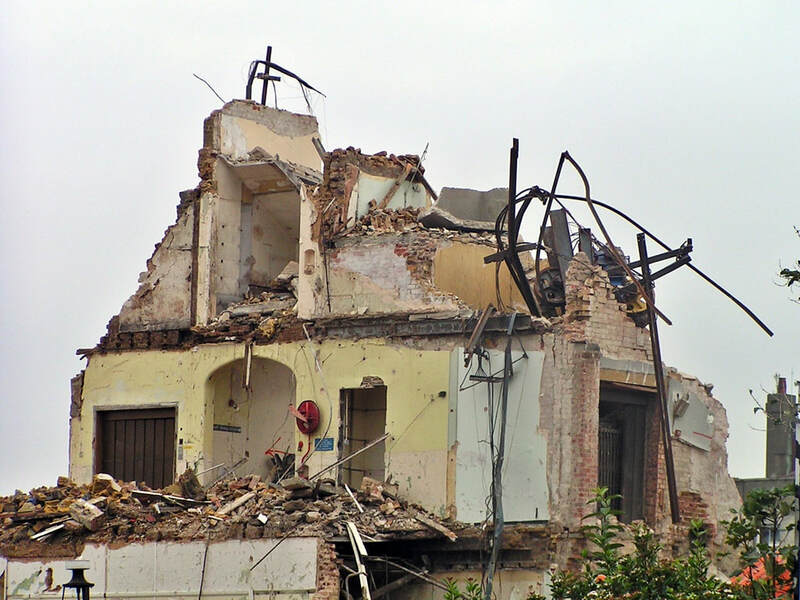 Seems the powers that be could have saved more a than a few bricks from a building with such handsome architecture." 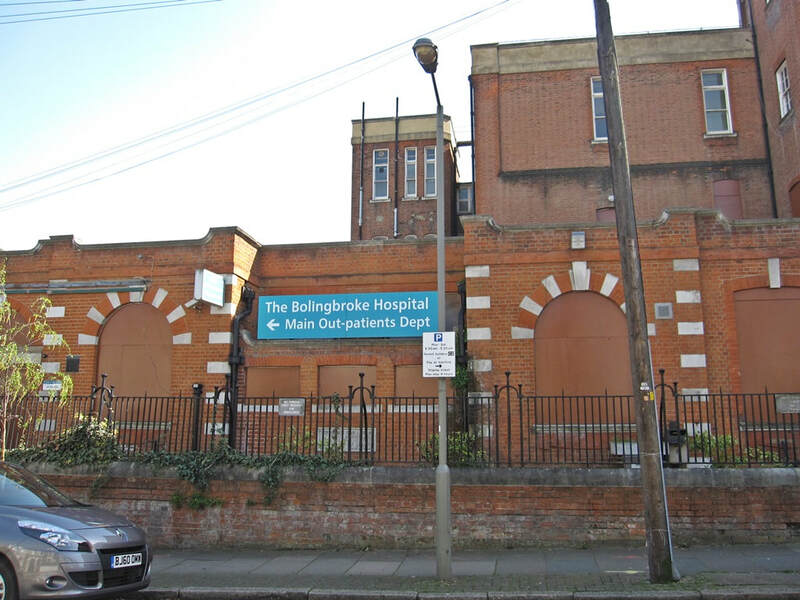 ​Although named after Viscount Bolingbroke, the hospital owed its existence largely to a nineteenth century vicar Canon J Erskine Clarke who formed the view that Battersea needed a hospital for those members of the local public who, in pre-NHS days, would prefer to pay for their hospital care rather than attend the Poor Law institutions which provided healthcare free of charge to the less affluent. 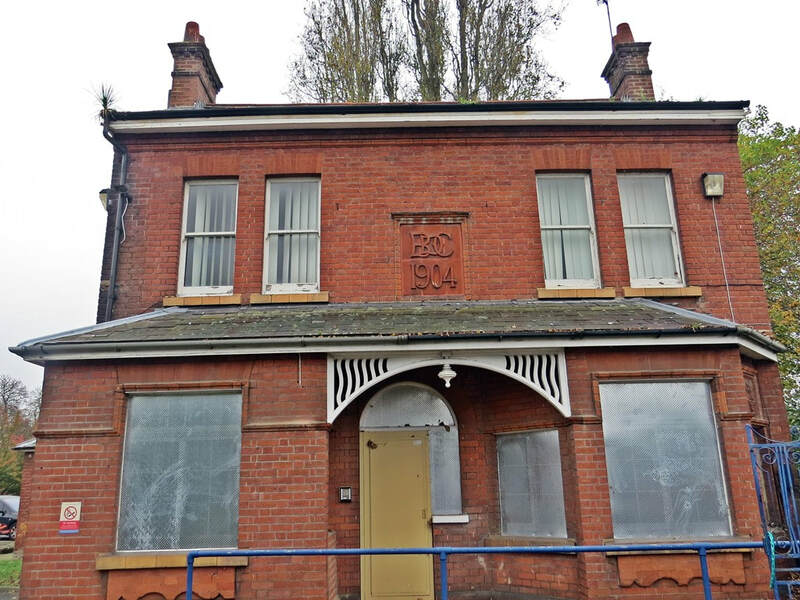 Canon Clarke oversaw negotiations to buy an old mansion named Bolingbroke House in 1876 and after much improvement and investment from philanthropic sources,the Bolingbroke Hospital first opened in 1880. 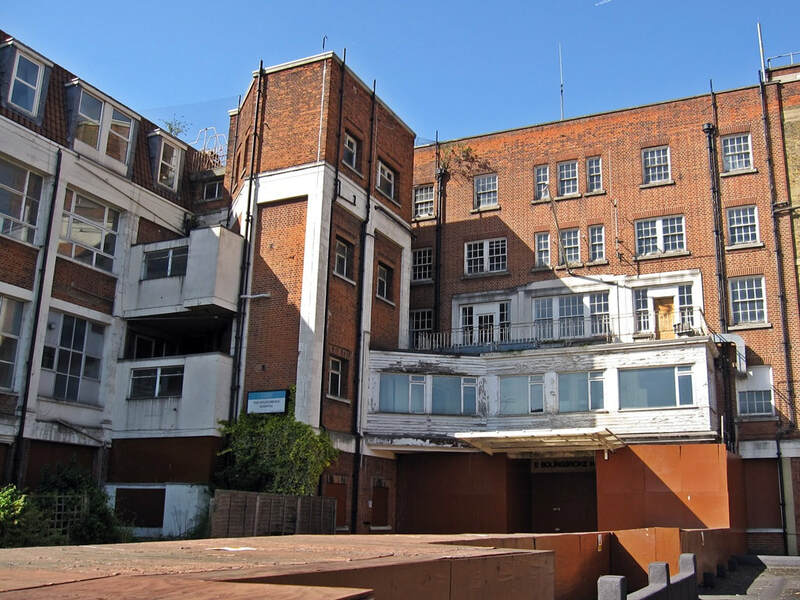 After the outbreak of the Second World War the Bolingbroke became affiliated to St Thomas’s Hospital, and was damaged by air raids in 1941, and by a V1 flying bomb in 1944. 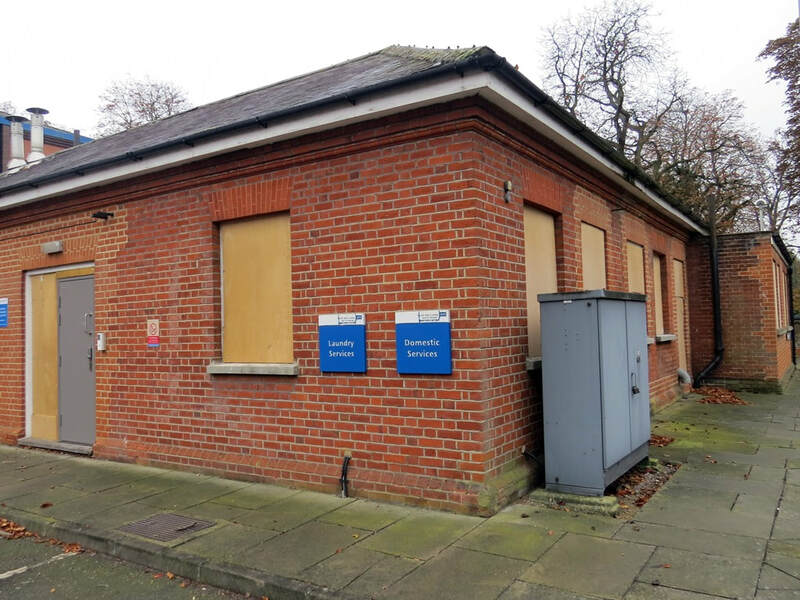 Rumours of the consequences of a report which led to the establishment of the NHS,were greeted with dismay by the hospital’s Board, which reported that the people of the area “would greatly regret to see it merged in a system of state hospitals. 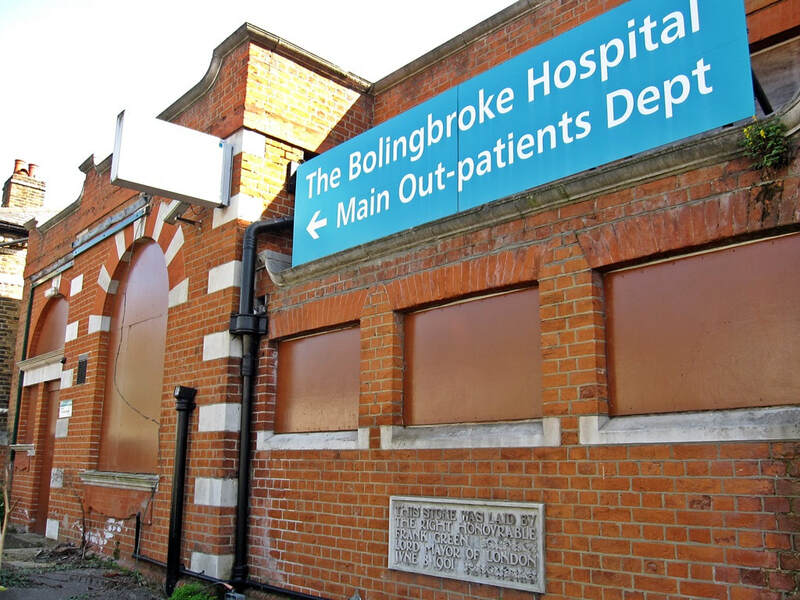 In 1948, despite these regrets, the Bolingbroke became part of the new National Health Service. 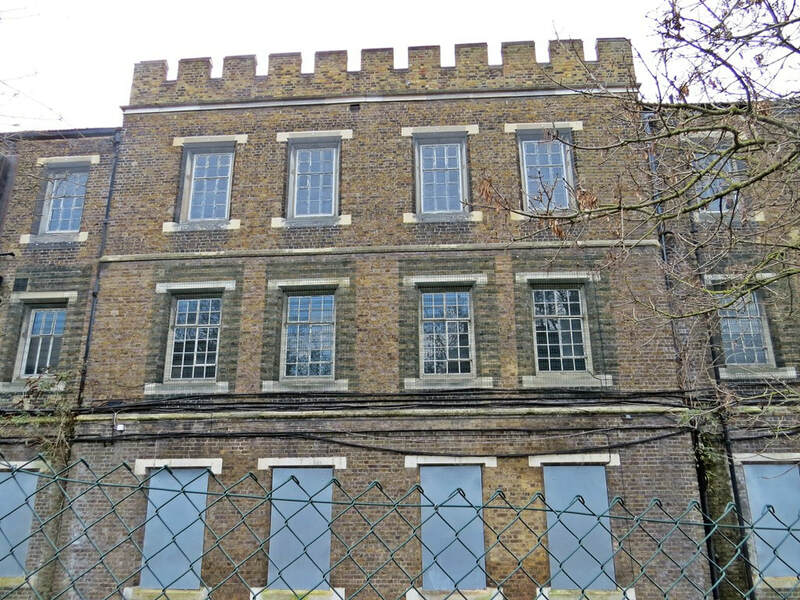 There was immense opposition from the local community to the closure and Wandsworth Councillors managed to block the plan. 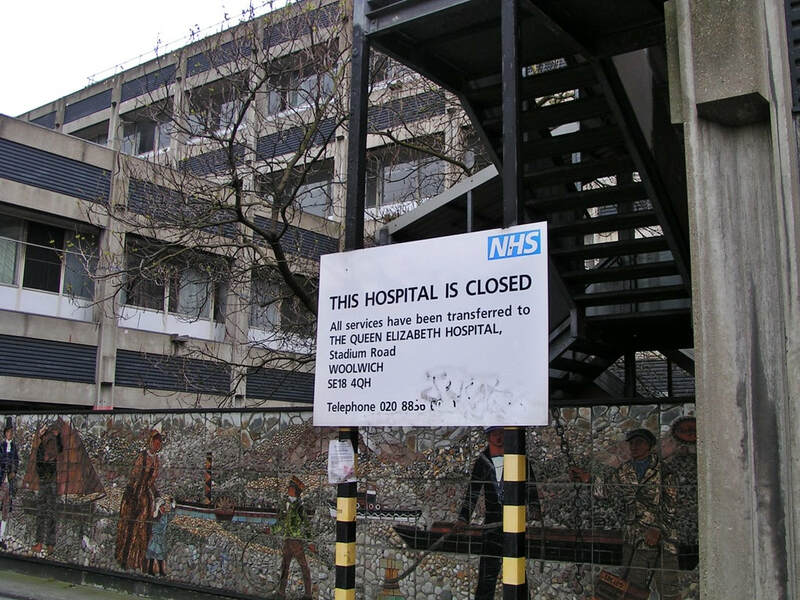 The issue was referred to the then Secretary of State for Health, Alan Johnson, who agreed in 2007. 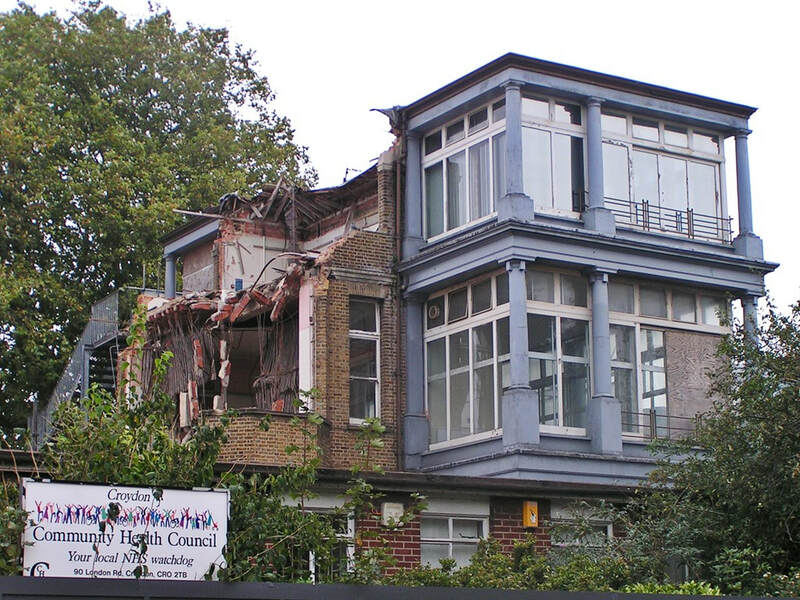 This situation was seen by Wandsworth Councillors as 'closure by stealth', whereby services were gradually withdrawn (so fewer patients attended) and the real estate deteriorated to the point that it was 'uneconomical' to repair and modernise the buildings (despite the Trusts having spent £2.5m in ward refurbishment). 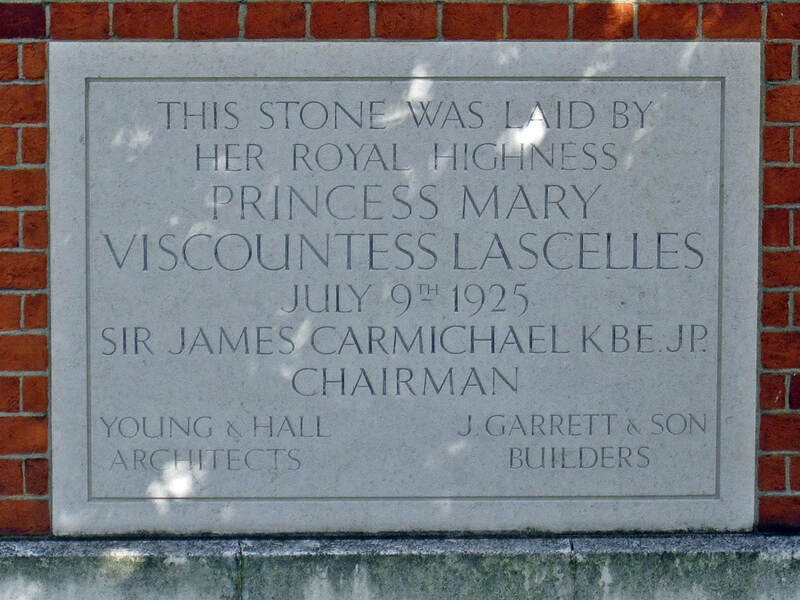 English Heritage have given the building a Grade II listing due to architectural interest, a rare set of children’s tiles and its “unusually lavish” marble-clad lobby, war memorials and radiated corridors. 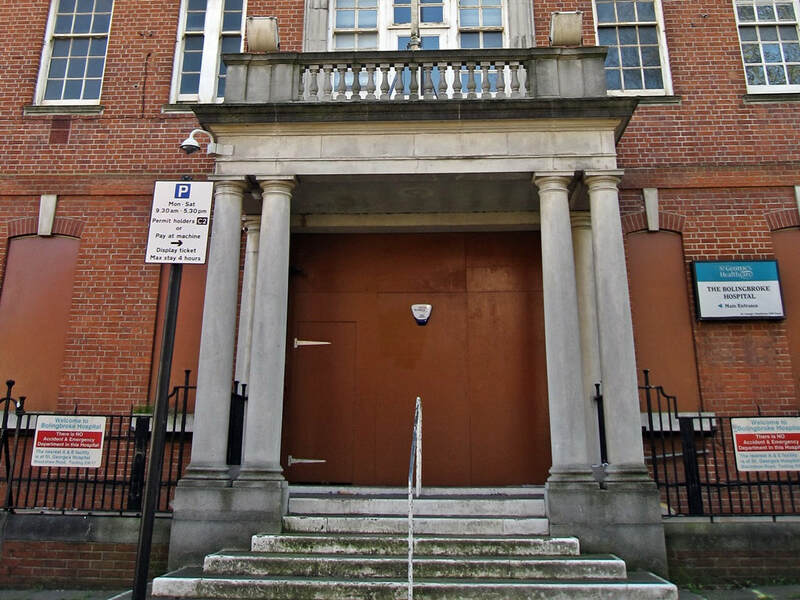 The building was converted to Bolingbroke Academy a "free school" influenced by the progressive Swedish education model. 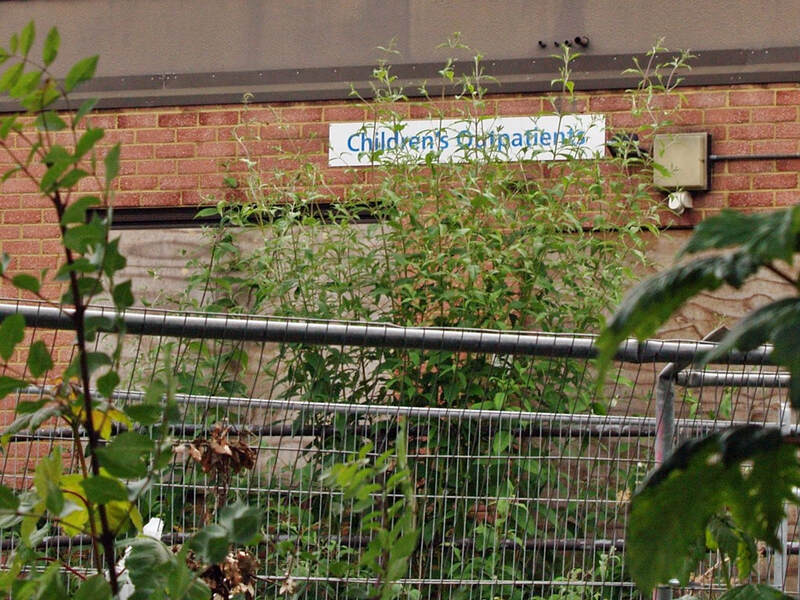 Free schools are taxpayer-funded, regulated by OFSTED and non-selective, but run by individuals or trusts, free from local authority control and with the scope for broad curriculum. 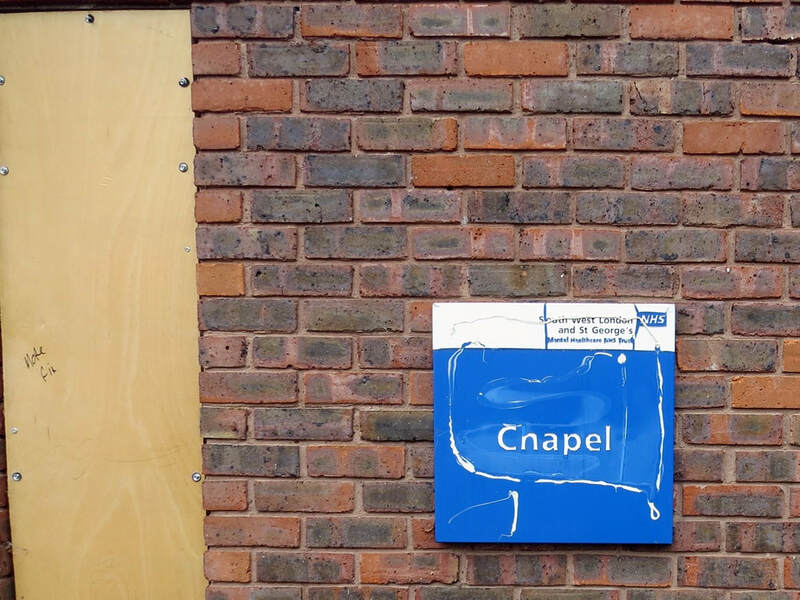 The school opened in September 2012. 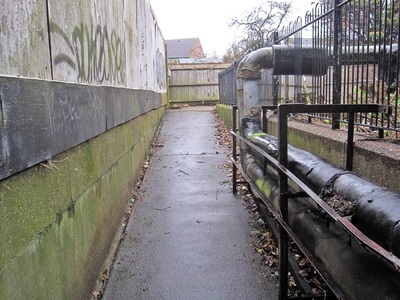 ​Wendy Mack writes to this website: "I remember working as a student nurse at Bolingbroke Hospital. 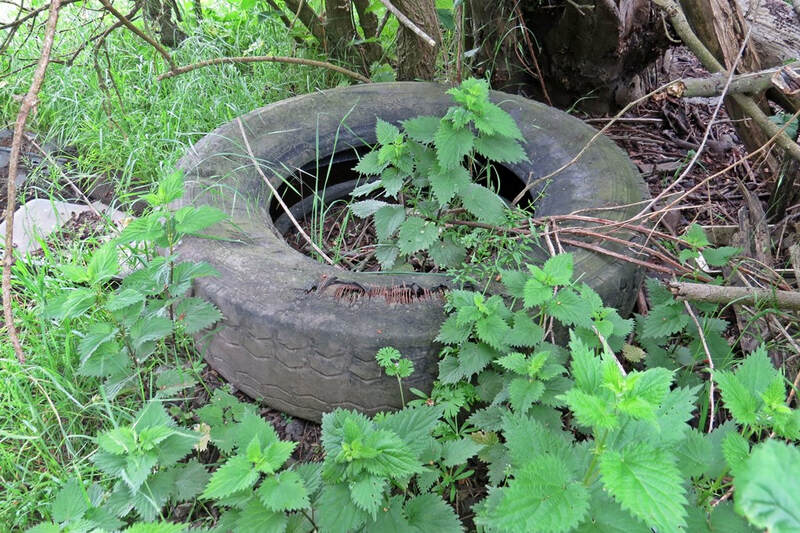 it was a grim experience, it was during the early 80's and care of the elderly left a lot to be desired. I remember the student nurses were always sent home early and the staff put the patients to bed very early in the evening. Treatment seemed outdated even then, but we tried to be kind to the patients and I remember meeting some great characters. I was also a student nurse at Springfield Hospital, it was a terrifying experience the staff were as scary as some of the patients. ECT was a regular type of treatment and patients were often dazed and befuddled afterwards. 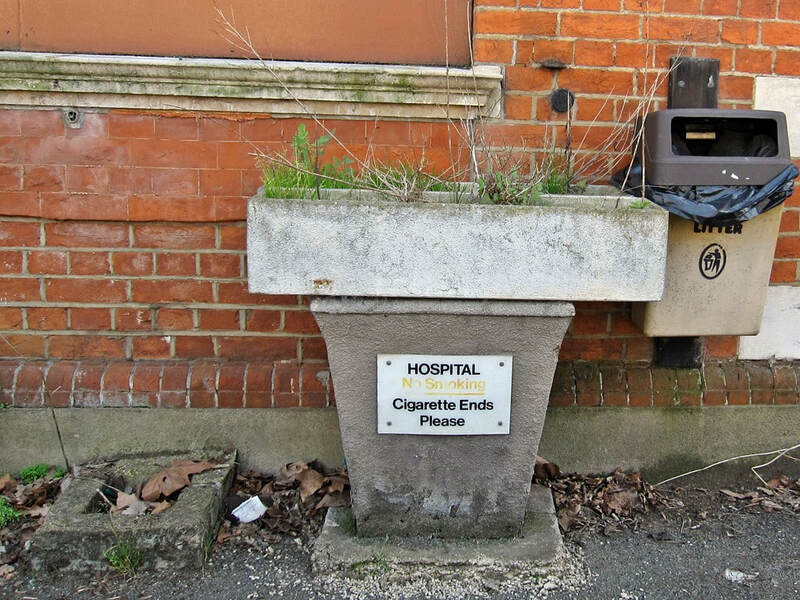 Patients smoked on the ward and we went home smelling of cigarette smoke. Two female patients fell in love with the charge nurse who locked himself in the office, which had windows on all sides. the woman spent hours tapping on the glass to get his attention. 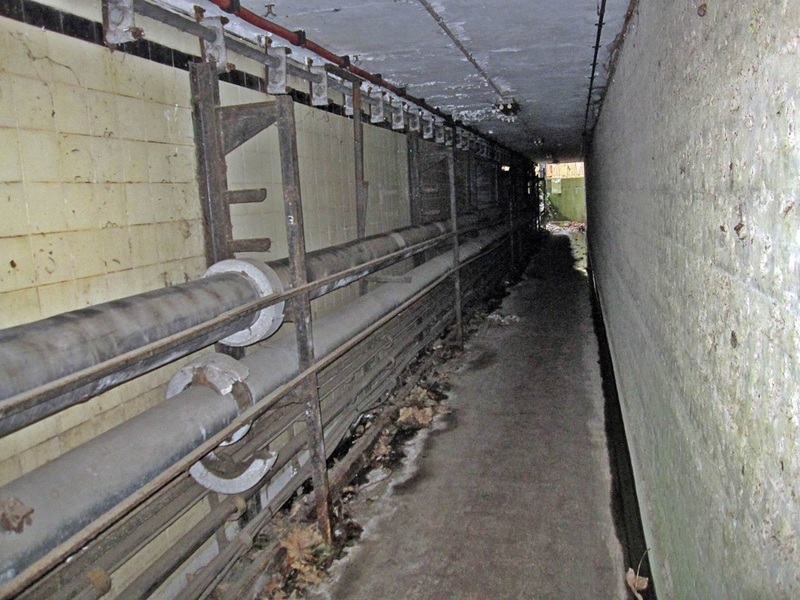 It was like something from One Flew Over The Cuckoo Nest. 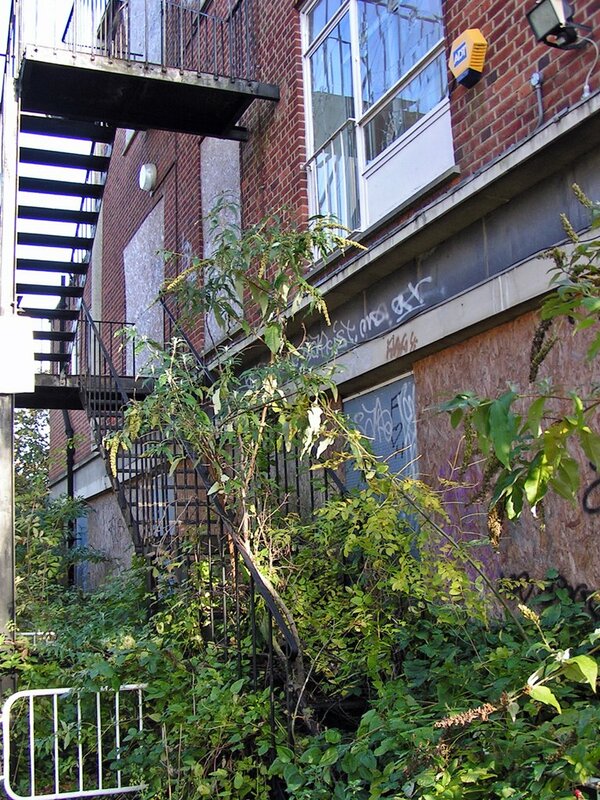 I was often scared and could not wait to return to the general wards. I think hospital care has greatly improved." 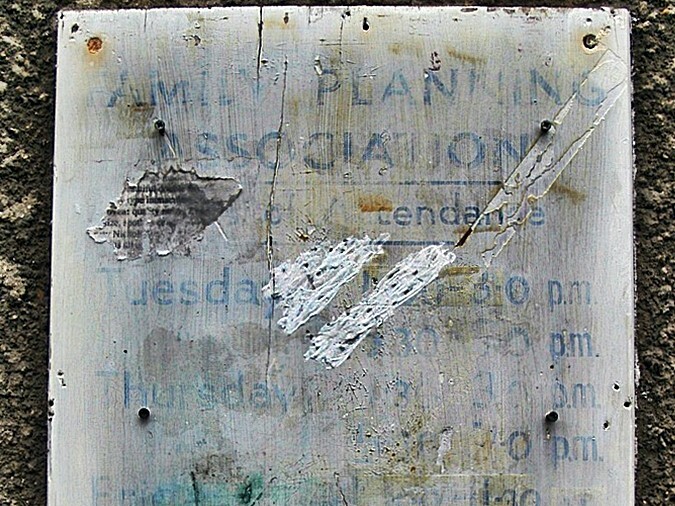 All of these photographs were taken in 2011. 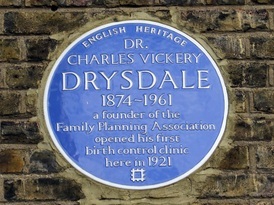 Charles Drysdale was the president of The Malthusian League, a British organisation which advocated for the elimination of penalties for promoting birth control as well as to promote public education in matters of contraception. 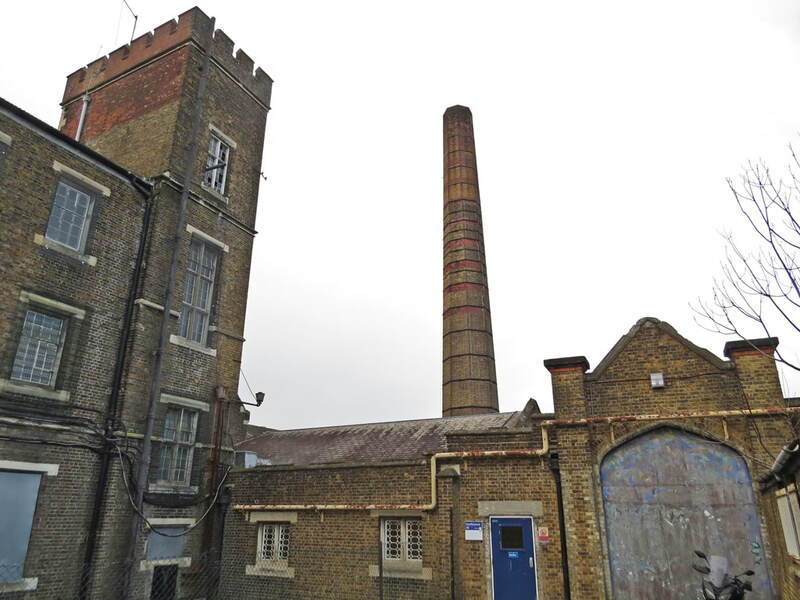 It was established in 1877 and was dissolved in 1927. 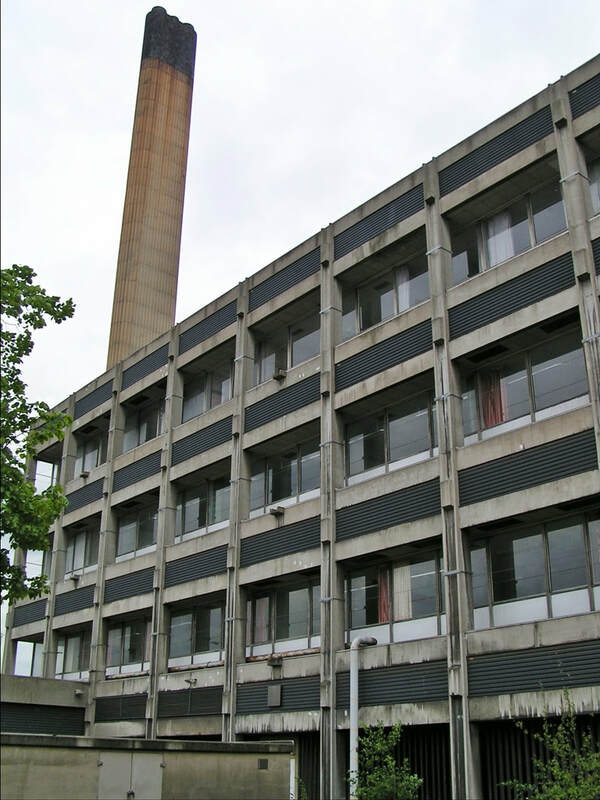 The organisation maintained that it was concerned about the poverty of the British working class and held that over-population was the chief cause of poverty. 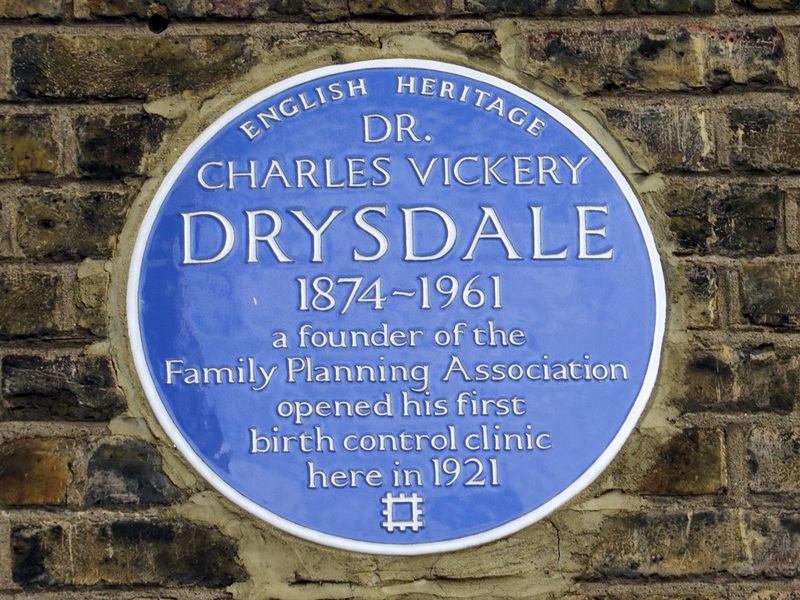 The League began plans for birth control clinic in 1917 but these stalled until they received funds from a philanthropist and finally the clinic opened the Walworth Women's Welfare Centre here in 1921 at East Street with Norman Haire, a prominent sexologist, as their medical officer. 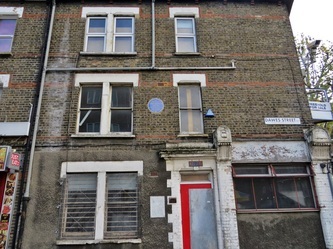 Marie Stopes and had opened her clinic in Holloway 9 months earlier. 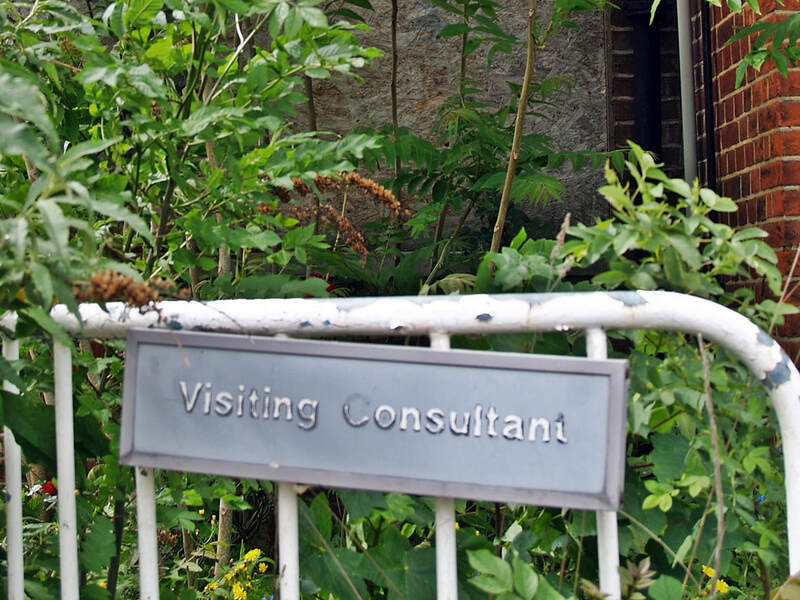 Stopes’ clinic was the first in the country though the Malthusian League always emphasised that theirs was the first English clinic where birth control instruction was given under medical supervision. 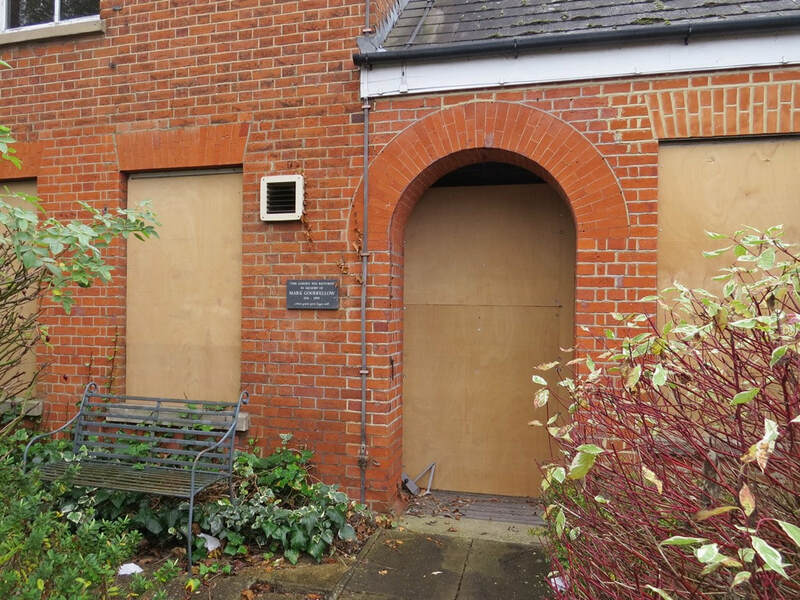 This building was occupied by the East Street Brook Advisory Centre (a young people's sexual health charity) before closing down around 2008 . 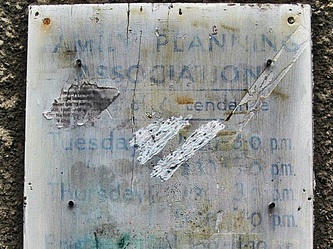 A faded old Family Planning sign was visible on the front of the building until 2015 (see pics below). 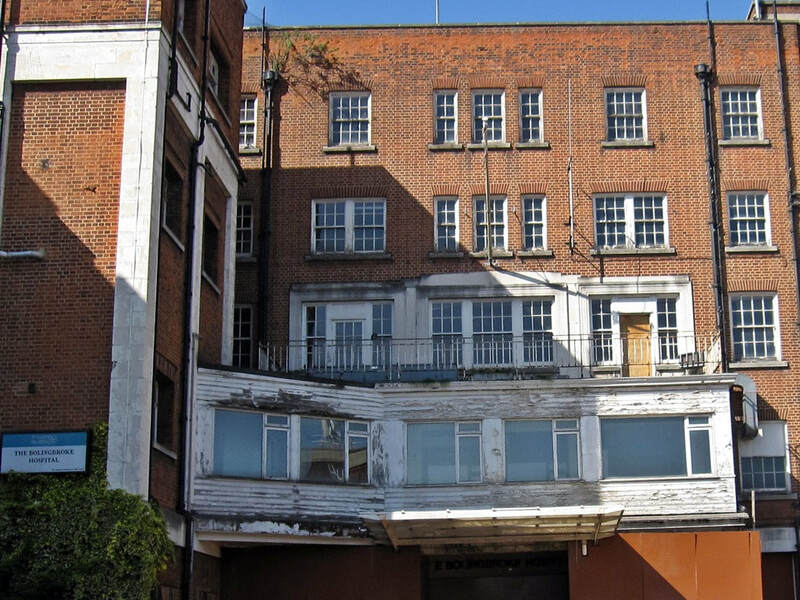 The building has since been converted into flats. 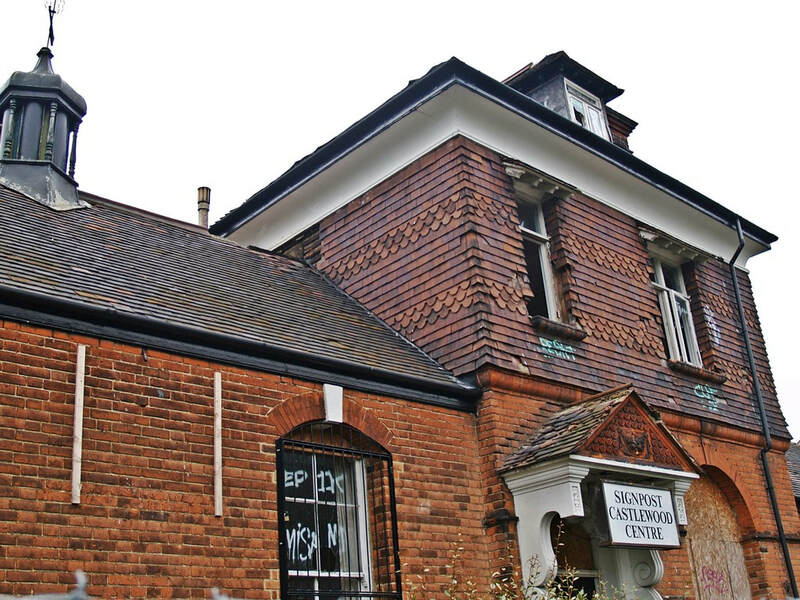 ​Morland Lodge built in the 1960’s was a three storey building that has been used in the past as a care home and by the Council’s community mental health team for older adults. 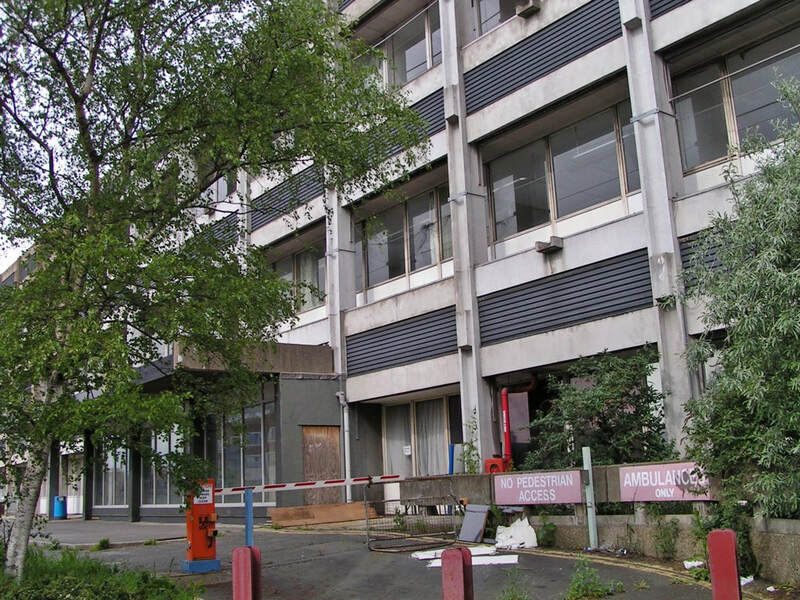 This building was located to the rear of Rees House, a five storey former Council Offices also built in the 1960’s. 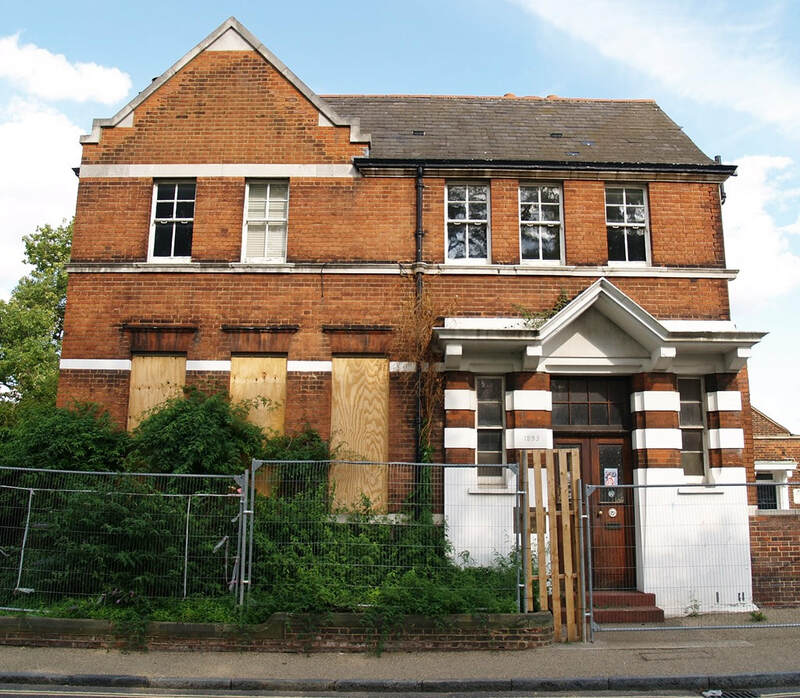 6 Morland Road was a separate Victorian building and was formerly an NHS clinic. 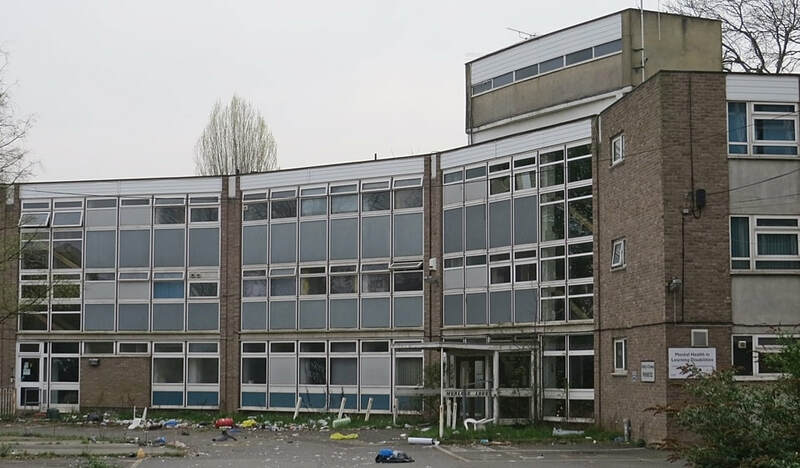 The three buildings were vacant since 2014 and demolished in 2018 to make way for a new secondary school. 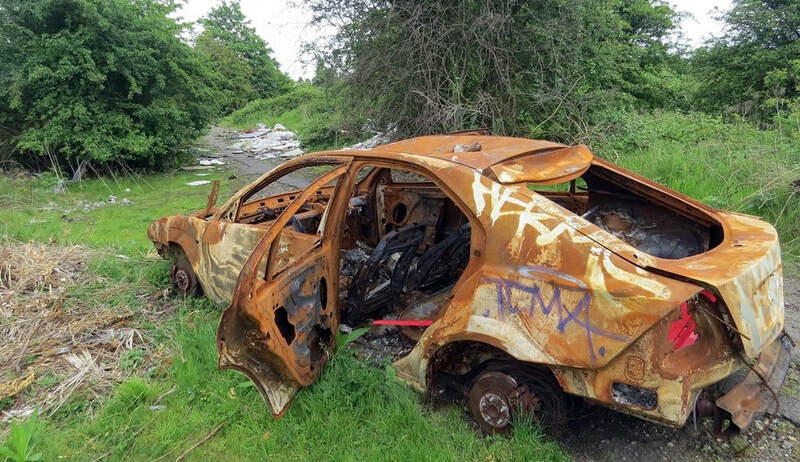 An unidentified man was found dead in the grounds shortly after closure in 2014. 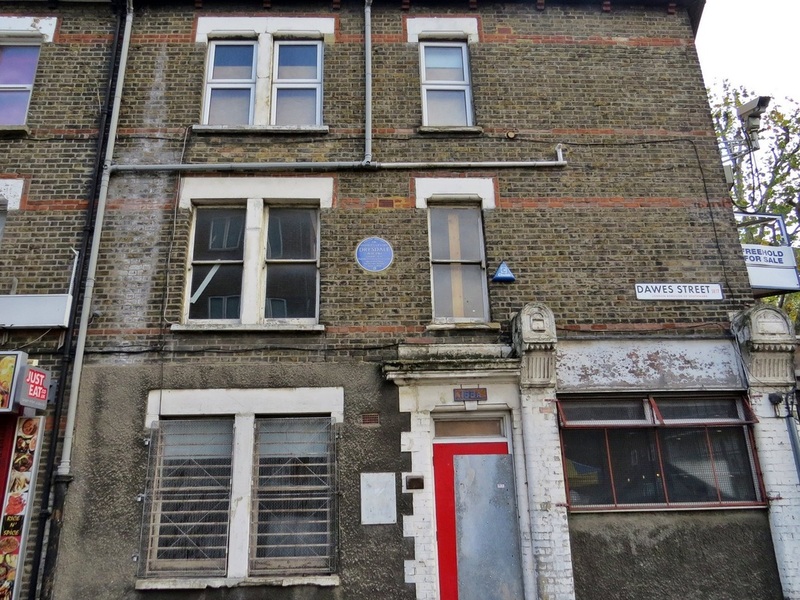 6 Morland Road was built as a private house but donated to the council by the Clark family in 1920 and named Robin House in memory of their deceased son.The building became the Industrial School for Boys providing residential detention accomodation to boys placed on remand by magistrates. 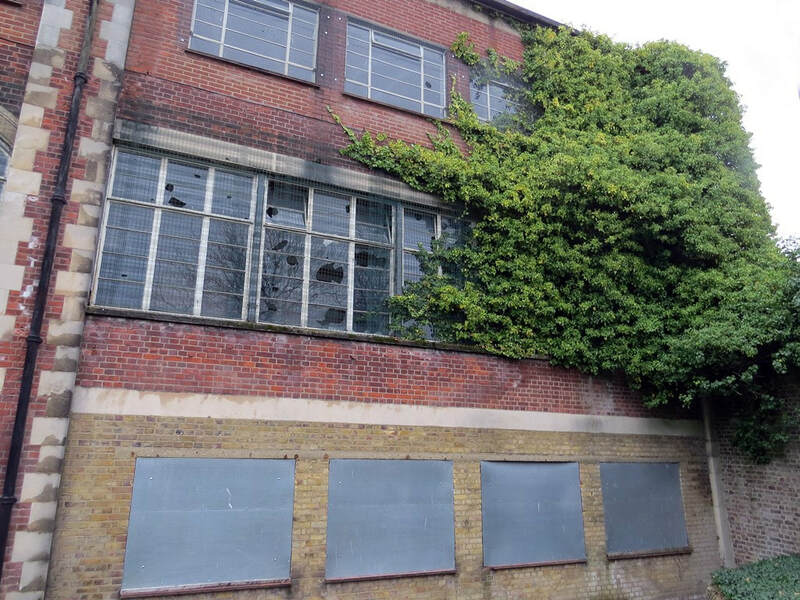 After investigations into harsh punishments dished out by the superintendant the school closed in the late 1920s and by 1934 it became the Croydon Occupational Centre for Unemployed Men, one of the first occupational centres in the country to open.The centre was seeing almost 300 men a day. 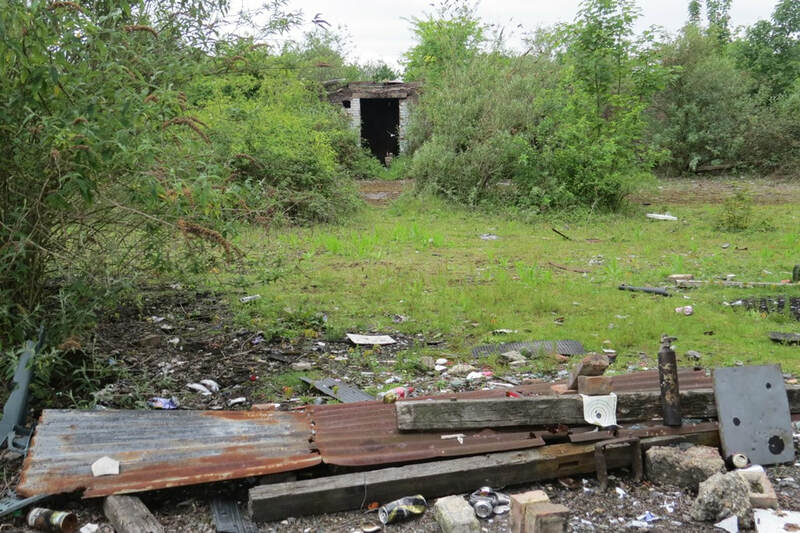 Activities within the centre developed the mens skills in carpentry, cooking & gardening . 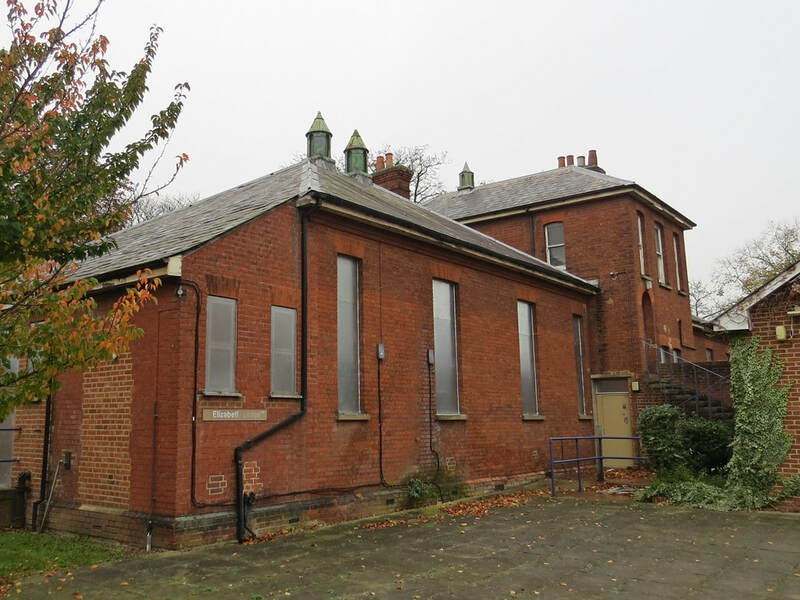 The centre also had a library and reading room, guest lectures, and sports and games facilities available to the men. The centre operated with the help of volunteers and helpers. 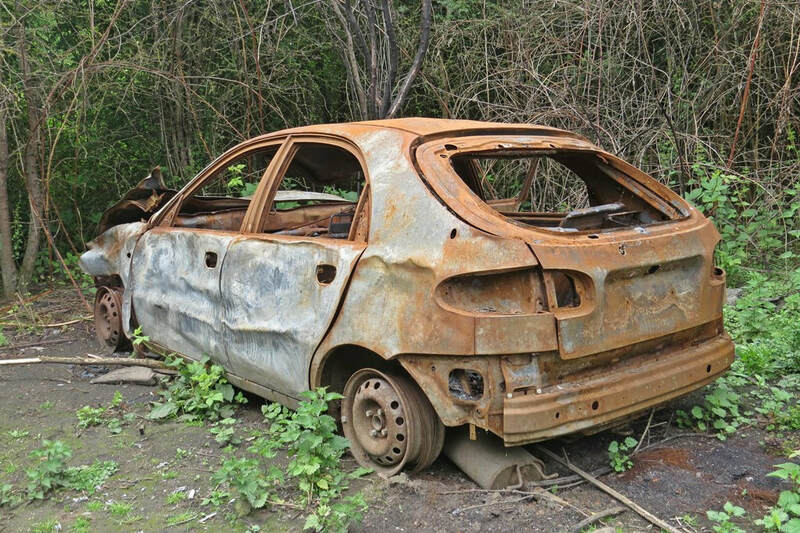 It was funded mainly by annual subscriptions. 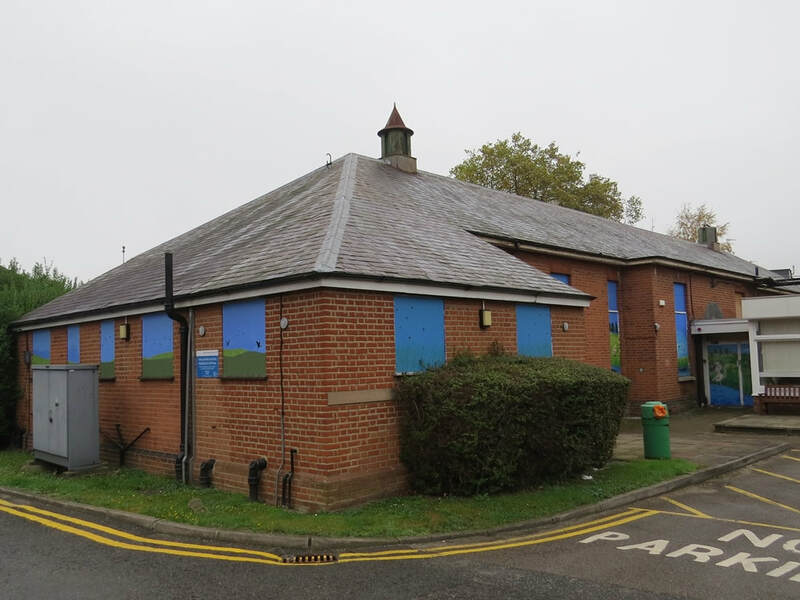 A Womens Section of the centre started on the site later that decade.It closed during the war and by the 1950s the building served as a nursery. 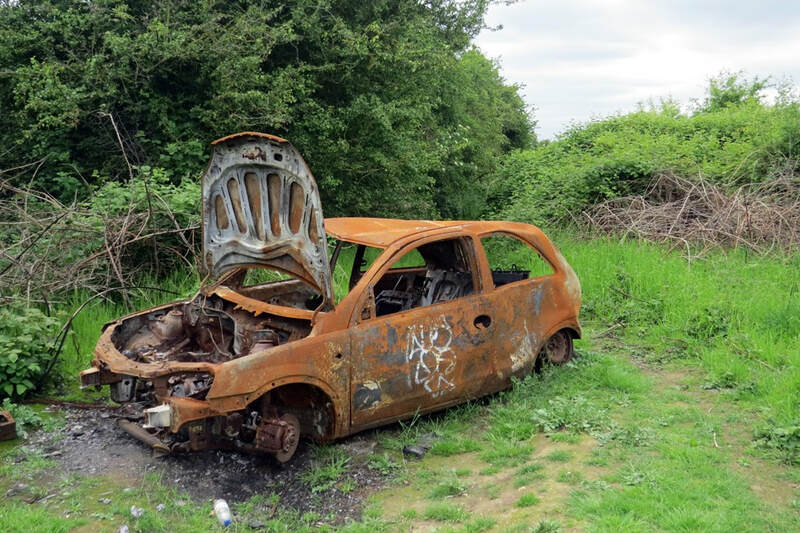 OK, not quite London but this is spitting distance from the border with the LB of Bexleyheath. 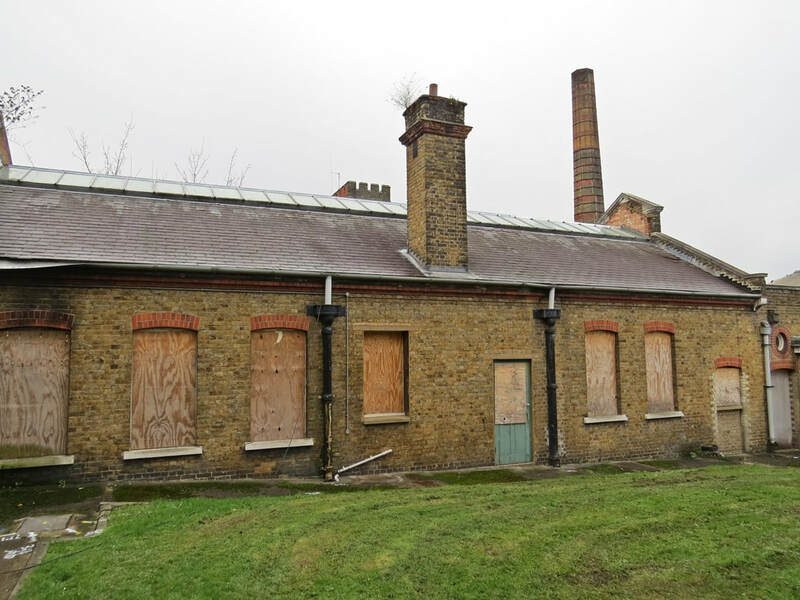 The orchard opened 1902 as a 800 bedded temporary hospital out on the isolated marshes along with the nearby Long Reach Hospital to cope with a smallpox epidemic. 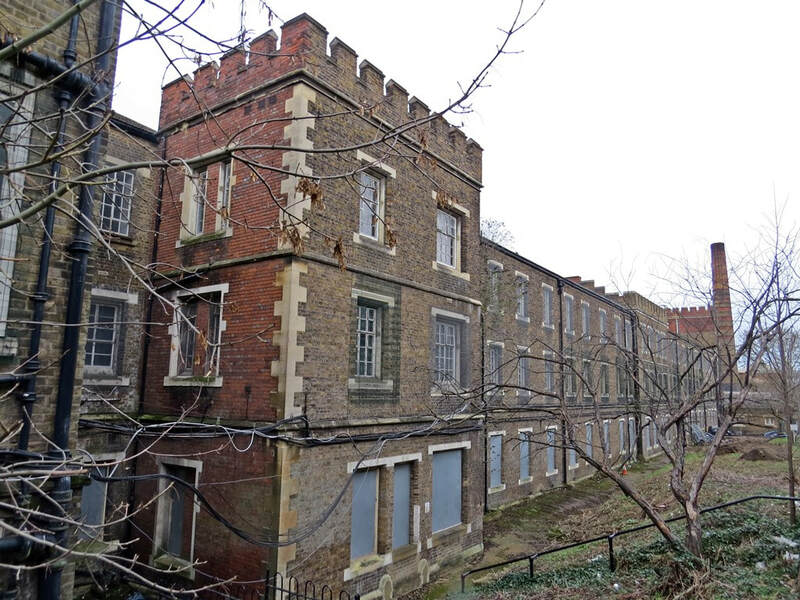 The number of beds available on hospital ships moored on the adjacent River Thames were proving insufficient and no one wanted a smallpox hospital in their town. 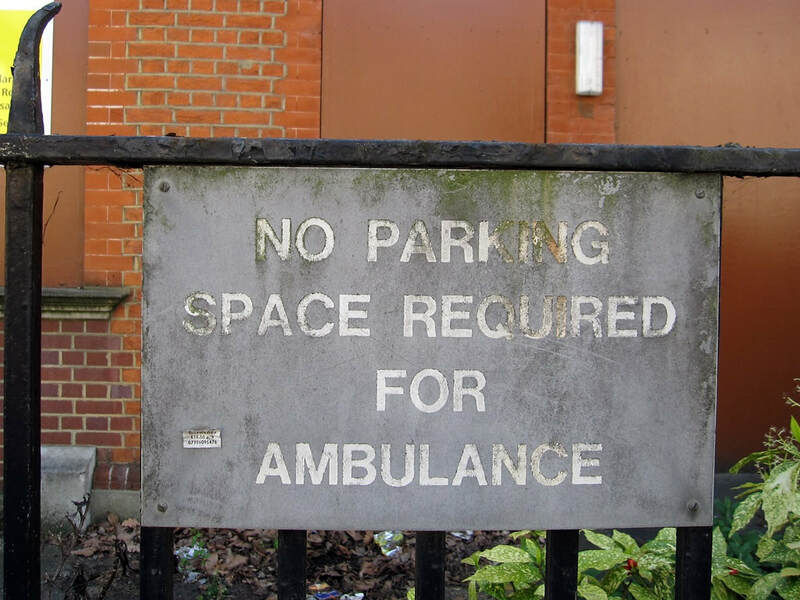 Patients were easily transported from London by the River Ambulances. After 1910 Long Reach was kept permanently in reserve for smallpox. It was apparent that in years of low incidence of smallpox there was high incidence of scarlet fever. 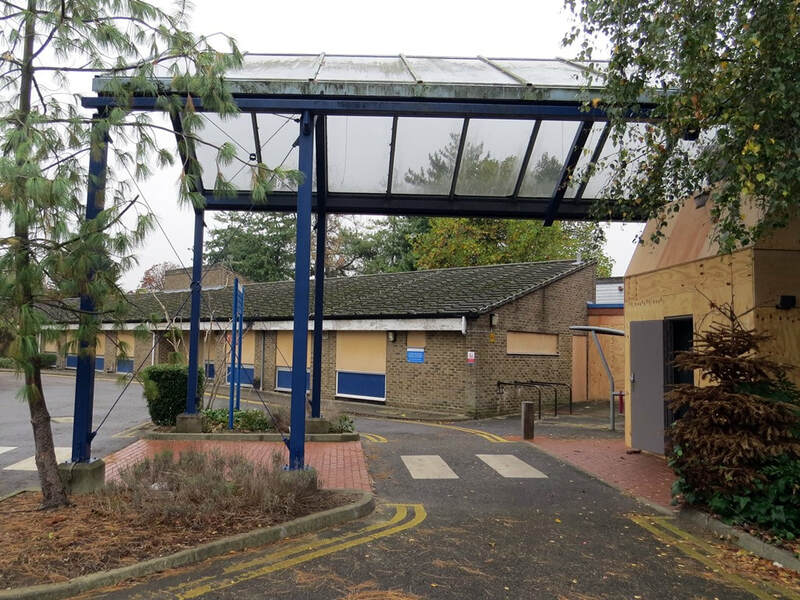 The Orchard and the (newly built) nearby Joyce Green hospitals were turned to fever hospitals when there was little smallpox.A tram network connected the 3 hospitals with the Thames River Ambulance pier. 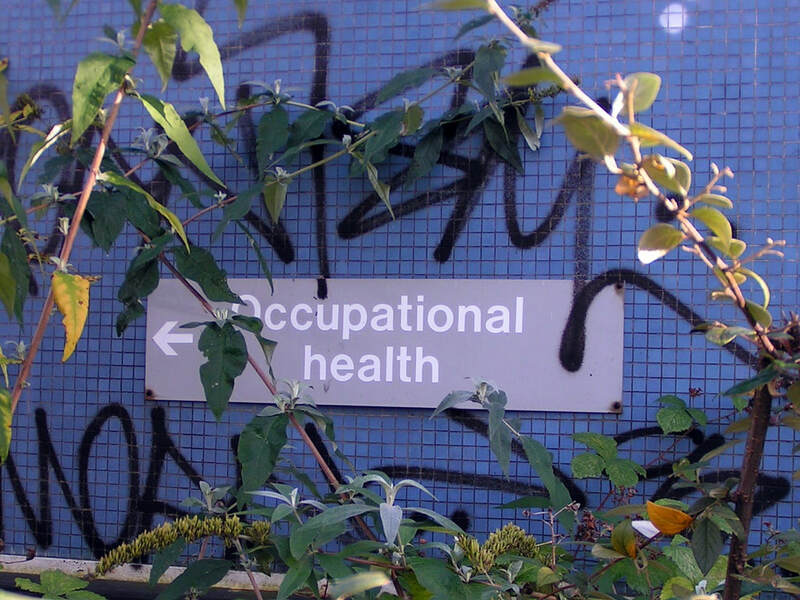 The Orchard spent much of its time closed and was only opened for major epidemics. 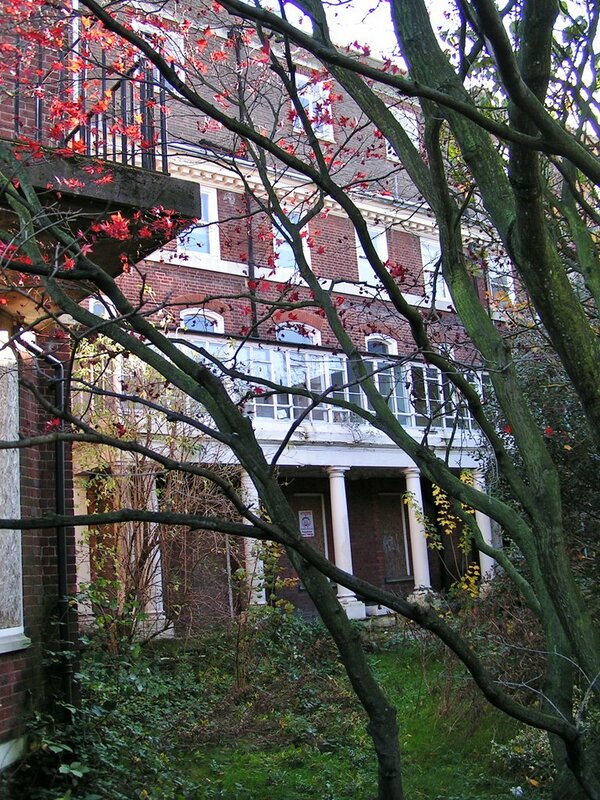 During the First World War the Orchard became the Dartford Australian Auxiliary Hospital.